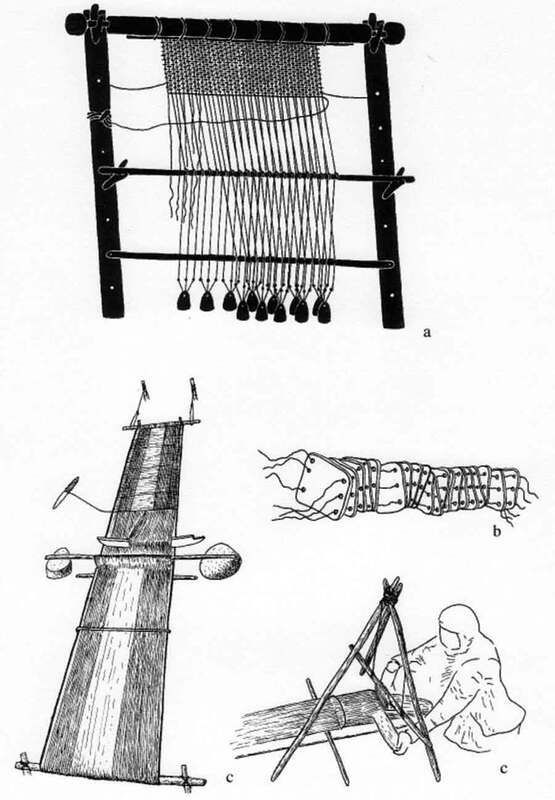 Textiles with vegetable and animal fibers made on simple looms (see looms) from the 3rd and 2nd century BC were found in the Kalmyk Steppe west of the Caspian Sea. Horse breeding and bridles were known in the Anatolian area and can be associated with a Mycaenean civilization (1). A Sintashta-Petrovka culture existed along the east of the Ural (see more information and map). They created chariots for fighting, ritual races and burial ceremonies. They were related to the metallurgic technologies of an Indo-Iranian tradition. Vedic (2) and Avestan (3) sources tell of a migration from Central and Southern Europe in the first century AD. Archaeological finds confirm these contacts between neighboring clans and the Siberian area. Cattle breeders and farmers were influenced and adopted new settlement structures and mythological views and moved with great herds to new grazing grounds. Nomadic lifestyles developed. The Samii peoples that also settled here were originally hunters and fishermen and started to domesticize reindeer and follow herds north (see more under Fenno-Scandinavia). Comparisons between Sarmatian and Sauromatian burial rituals and their handicraft in graves and stocks show that all regions held not only one unique culture during the early Iron Age. Rich grave offerings found in Tillya Teppe (4) and their iconographic motifs give insight into the social standing of the dead. Objects of art found in the Gordion kurgans (5) in Phrygia (Anatolia), and in the Bashadar and Pazyryk kurgans (6) in the Altai Mountains can be accorded to the animal style of an early nomad culture and may be considered a derivative of an originally shamanic art or an “art of survival” after death. A warrior nobility and its art came to the forefront in the Bronze Age in Bactria (7) and Lurististan (8). 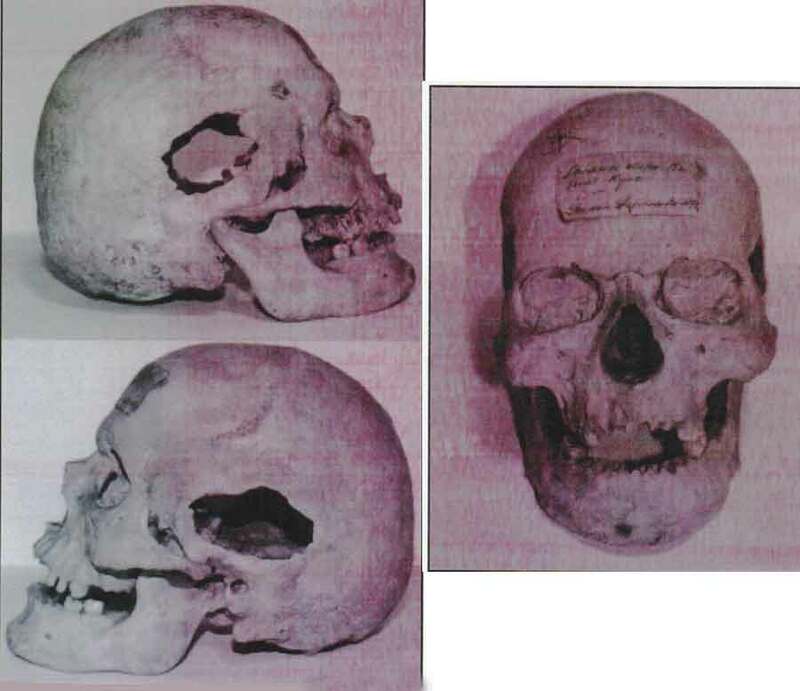 Trepanations (skull treatments), embalming, mummification, body tattoos and bone handling were also known in the old Mongolian, Tuvinian world and were also practiced by clans in the region of Kazakhstan and South Siberia (see sculls). Geometric motifs in handicraft and a Scytho-Siberian art involving the animal style (9) were connected to the ethnically, culturally and linguistically related Xiongnu and were possibly part of a tradition of transregional spread in that era, while still keeping their regional qualities. Horse harnesses, petroglyphs and ritual objects from finds from Arshan (10) and the Pazyryk culture in Altai may be associated with this Scytho-Siberian era. Holy places were common to these diverse cultures  as petroglyphs in Terekty Aulie (11) in central Kazakhstan show  but included different experiences as images engraved in stone or symbols of a ghostly power show. They believed in an animatronic world and its unreachable riches to which sacrifices must be made at cultic sites. (1) The term Mycaenean civilization is a modern term that is connected to the excavations that Heinrich Schliemann, among others, conducted in the Bronze-Age compound of Mycenae. It is not known what the early Greek population in the Aegeis called itself but it is assumed that they formed within the clan of the Achaea as is contained in Homer’s writings. A Mycaenean culture of a late cycladic era could be found on the Cycladic Islands. The Mycaenean era is considered the first high culture of the European region. As could be seen since the decryption of the linear B writing in the 1950s, it is thought to be an early form of Greek. The Mycaenean culture suddenly appears in a phase in the Middle Helladic Period from the late 17th century BC (according to traditional chronology, or ca. 1750 BC). The dead are interred with ostentatious grave offerings. Contact existed not only with Crete but also with Egypt (see map). (2) Veda (knowledge) is a collection of religious Hindu writings that was passed down first orally and later in writing. For most branches of Hinduism, their basic authority is uncontested. The core of the Veda are writings of the Sruthi, which are epiphanies of the rishis (the wise). (3) The Avesta (probably from old Iranian “to praise”) is the holy book of the zoroastric religion that goes back to the founder of the religion, Zarathustra. It is a collection of writings of varying linguistic and stylistic forms and from different times and contains among other things the Gathas that is attributed to the prophet himself. (4) Tillya Tepe (the golden hill) lies in north Afghanistan. In 1978, six graves were found there during excavations that date back to the time around the Nativity (for more information see: "Tillya Tepe"). (5) Gordion was the capital of the Phrygian Empire and rediscovered by the brothers Gustav and Alfred Körte in 1895. In 1900, they conducted the first excavations on the settlement hill and explored several tumuli in the surroundings. (6) Tuekta-Bashadar culture: Artifacts from early nomadic cultures of southern Siberia. Excavations in the 1920s in the Pazyryk region in the Altai Mountains, where the frozen ground (permafrost) conserved organic material (for more information see: „Tujekta-Baschadar-Pasyryk-Kultur“). (7) Bactria is the historic name of a landscape around the former capital Bactra (modern Balch) that is located north of the Hindukush and south of the river Amu Darya. The region that the founder of the zoroastric religion, Zarathustra, might be from belongs mainly to North Afghanistan and southern Turkestan today. The inhabitants of Bactria were the Bactrians and the Scythians and other peoples that invaded the area. The Persian Great King Cyrus II. conquered Bactria around 538 BC and turned it into a satrapy of the Achaemenid empire (for more information see: "Tillya Tepe"). Zagros mountains (for more information see: "Parthians  Persians"). (9) Scytho-Siberian animal style  for more information see:“Animal Style”. (10) Arshan (Arzhan) is a village and also a term for the homonymous, previously Scythian funeral site of chieftains located there, in Central Asia and the northwest of the Republic Tuva whose history came to light by means of several excavations. (11) Terekty Aulie, Kazakhstan  for more information see: "Petroglyphs". 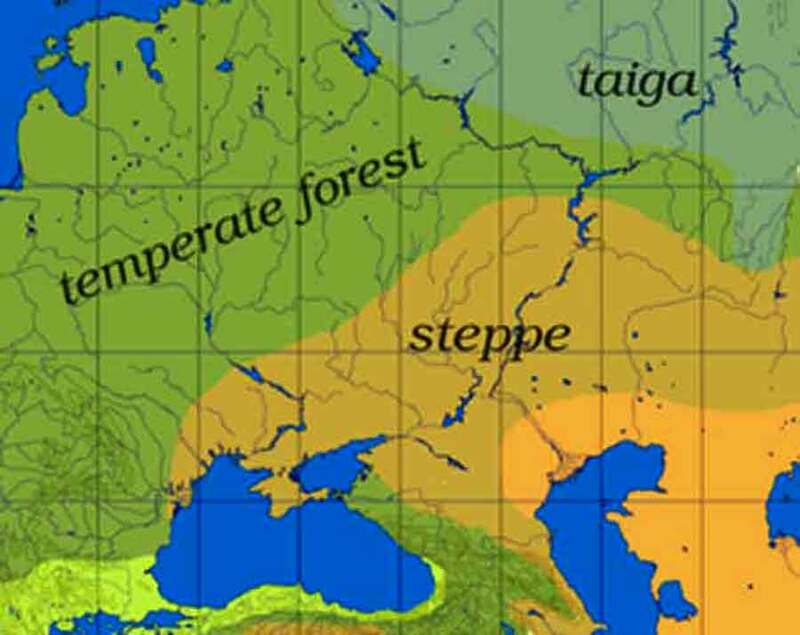 Between the 9th and 3rd centuries AD various clans settled in this forest-steppe zone, the Pannonian Basin and east of the Ural (see map) during the early Iron Age with a distinctive life style and funeral sites that were similar economically and stylistically to those in the Eurasian and Central Asian area. Finds from the 9th century until the 7th century BC in Central Europe, Eastern Europe or the Carpathian Basin (see map: Pannonian Basin. Carpathian Basin and Hungarian Basin) brought to light ornaments on horse harnesses, trapper equipment and weapons that can be associated to an early Dacian Cimmerian culture (1). Riding warriors had invaded here and mixed with the sedentary cattle breeders. Some clans had their original homes in the northern Caucasian and Pontian steppes (see map Pontian steppe). Contacts through trade existed earlier. The greater part of finds in the Carpathian Basin and therefore in the greater area of the Hungarian Basin that form the western part of the Eurasian steppe belt can be attributed to these immigrated riding clans. They greatly contributed to changes to the cultural profile. Finds from the 9th century BC also show changes towards an early migration in the time from the 13th until the 11th century BC that was caused by a change in nature and climate. A local population adapted to the steppe-oriented invaders towards lifestyles with mobile herding. Traditions of the material culture were brought from east to west. A blending of the steppe-oriented nomadic clans and the sedentary community took place in the late Urnfield and Hallstatt periods (see also „Celtics“) and continued from there. They engaged in mining and alpine farming. Lifestyles on the Eastern Alpine Fringe and in Transdanubia (2) were antagonistic. This interface between east and west reveals a complex pattern of conflicts in the interchange of traditions. A number of weapons made in the Bronze Age in Central and Southeast Europe and treasures found in graves must be from the invading riding warriors. Analogies of eastern steppe peoples show this. 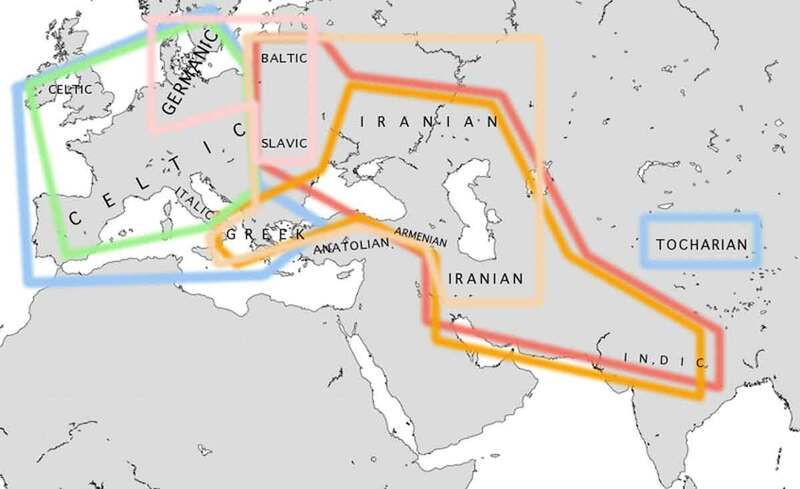 Herodotus’s descriptions point to the Kimmerians that were expelled from their home by the Scythians and fled from the suppression via the Black Sea to the land of the Medes. 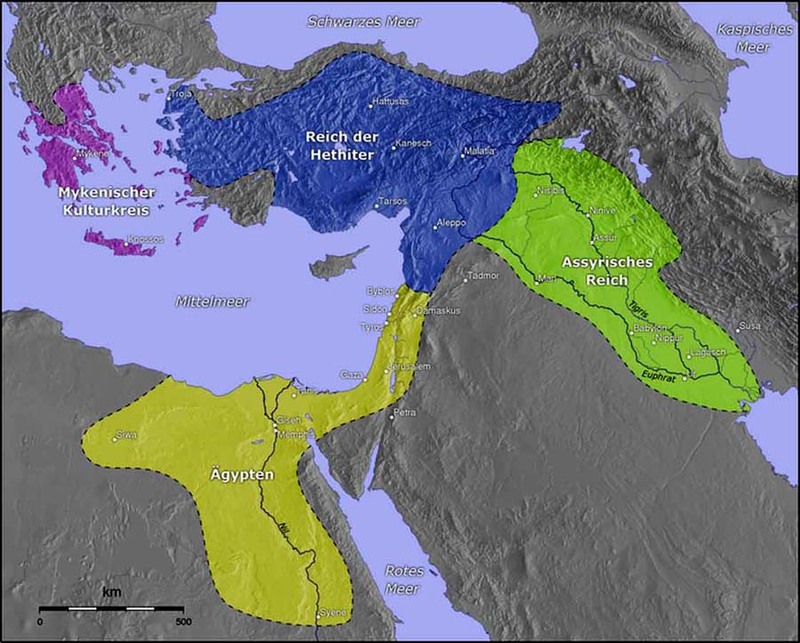 Accounts of their activities in Anatolia and northern Assyria are abundant, and reports of their attacks against Urartu and Assyria are to be found in Accadian written sources, which record events from the late 8th century to the middle of the 7th century BC. In the northern Pontian steppe and in the forest-steppe zones, weapons such as bimetallic daggers, iron and bronze spearheads and different types of iron or bronze jewelry as well as horse gear were found in inhumation cemeteries that can be attributed to the Kimmerians and their funerals of warriors with equipment and horse. - see also „Kimmerer“ under „Tujekta-Baschadar-Pasyryk-Kultur“ in the Altai region (central Asia) and further information on the clans and the „History of the Equestrian Nomads“. 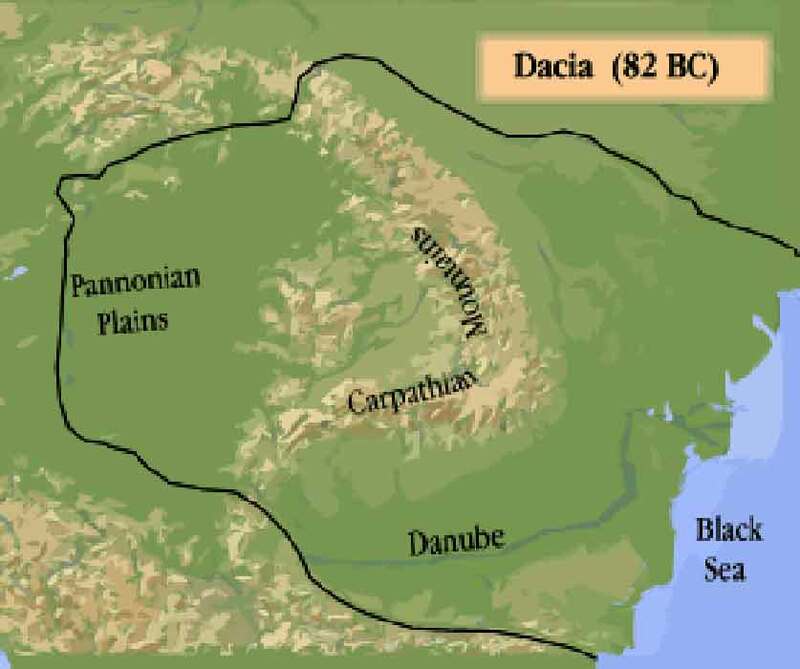 The Dacians settled in the area along the Black Sea coast after the 5th century BC. They are closely related to and probably shared a common language with the neighboring Getes. Only since the 1st century BC are both clans united in the Dacian Empire. After their submission by Traja the Roman province (Dacia) reached the territory inhabited by them. 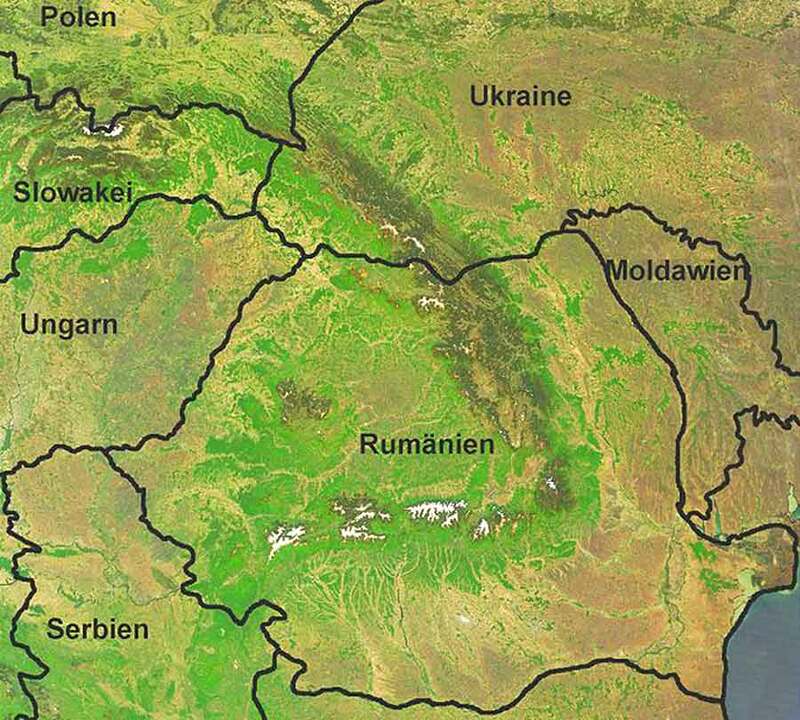 The province extended farther than the territory of modern Romania and included parts of the Pannonian Basin (in modern Hungary and Vojvodina) in the west and parts of Moldavia and Bulgaria in the east (see map). Historians trace the origins of Romanians to the Dacoromans and Dacians. 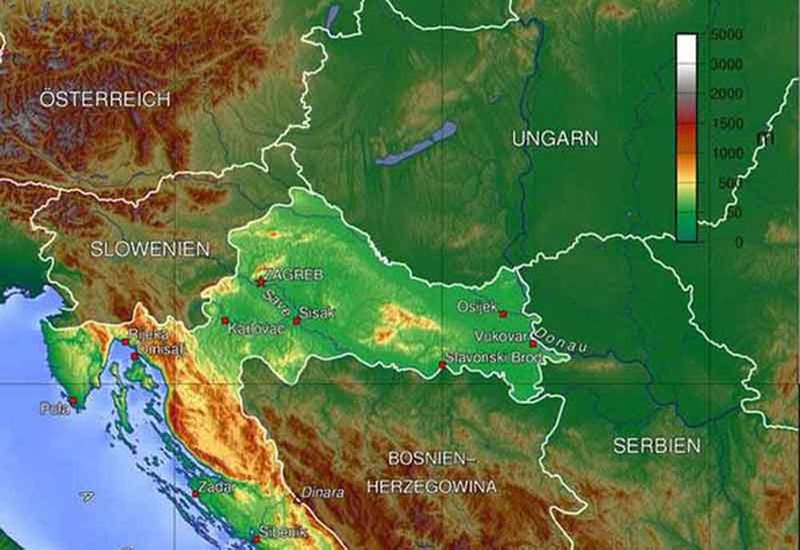 (2) Transdanubia (“beyond the Danube”), refers to the parts of Hungary to the right (south and west) of the Danube. Graves dating back to the 9th until early 7th centuries BC were found near rivers in forest steppes in the Hungarian Basin and are considered pre-Scythian. They are built on slight elevations such as sand dunes or were found in forsaken settlements with small cemeteries. More than two pits contained grave offerings, normally a large pot, a cup or a bowl. Cow and sheep bones show that they were carnivores. Stones or millstones laid next to the deceased were typical grave offerings as were richly decorated bone plates in female graves. Weapons and horse burials were not found in such pre-Scythian graves from this time in the northern Pannonian steppe. It actually became clear that burial rituals practiced here were very different to those in the Carpathian Basin of the Middle Bronze Age. Until the 10th and 9th centuries BC, cemeteries with cremation graves and distinctive ceramics existed in the northeast of Hungary and parts of Slovakia. This explains why a different culture prevailed in the open steppes farther north and east towards the Caspian Sea or in the west to the northern Pontic steppe and in the region towards the Vitava. In the Great Hungarian Plain, a steppe lifestyle with cattle breeding, herds of cattle, sheep and horses was predominant during the early Iron Age. Considering the great Neolithic and early and middle Bronze Age finds with settlements or a late Bronze Age cremation in cemeteries that were used for generations, this was not always the case. Riding warriors and their followers entered these areas beyond the Carpathians and brought new burial customs from the North Caucasus, where weapons such as metal daggers, spearheads of iron and bronze and various artifacts in iron or bronze as well as horse gear appeared as grave offerings. This riding warrior elite developed sometime around 900 BC. Horse burials from this time were not found among these pre-Scythian graves in the northern Pannonian steppe or in the Carpathian Basin. Deforestation for mining led to large emissions and changes in the environment. Examples can still be observed today. Long-term deforestation in the plains has harmed the environment since the Neolithic Age through mining and smeltering and through intense grazing in the steppes of the eastern Carpathian Basin and the Transcarpathians. A decrease in population and settlements ensued after 800 BC. In addition, the power structures in the eastern Carpathian Basin changed. Another reason were increasingly large metal production centers with trade that intensified the crisis. Standing traditional and religious customs regarding life after death were no longer lived by. Instead a new concept of the afterlife prevailed and new political power structures and world views developed as a result of the political crisis. Eastern contacts were most obvious in the handicraft and horse gear and probably played an important role in the changes in society. These contacts can help understand the role of the newly developed cultural network of an early Iron Age in Southeast and Central Europe that opened a greater European perspective. This kind of communication network with transregional contacts probably also supported intermarriage. Earrings of transregional origin were found in graves and support the theory of such contacts. An intense communication with homeland rituals was also confirmed by motifs in pottery ornaments. The trade of presents with horses and their ostentatious bronze gear and chariots supported these adjustments, as did knowledge that helped these communities. These ostentatious gifts of horses and gear are described in the Iliad (protohistoric myths and stories accorded to Homer) as well as in the Assyrian chronicles and later sources. An emergence of a cavalry with newly developed horse gear brought decisive benefits in battle. Horses played an important role in these riding clans, regarding their social and religious ideas of the universe. Riding elites formed in the eastern steppe and northern Caucasus and brought new kinds of hierarchies to these mobile and sedentary cattle breeding communities. Such an elite must have invaded the upper Dnieper region and contributed to the transfer of these military capabilities to the Carpathian Basin. Prestige ware inspired by the east in handicrafts and horse gear with imported horses also led to changes and new concepts of power. Sarmatians that settled in the Don and Volga regions show similarities in their ceramics. The nomads in this region only had temporary camps in the open steppe during the 8th and 7th centuries BC, though they also owned steady settlements in the forest steppes. The nomads in the steppes learned to work with iron. Their world views can be found in various handicrafts with traditional motifs like those of the Scytho-Siberian "Animal style". Grave traditions emerged, according to which warriors were buried with grave offerings, among them weapons, horses and horse gear. Richly decorated handicrafts were found in the kurgans, among them numerous bronze and gold pieces with decorations. The Scythians at the Black Sea or the Saka in the Aral-Lake steppe were the creators of this durable material and spiritual culture as described in the Persian and Achaemenid writings. Their handicraft can be found in the far-eastern steppes all the way to the Yenisei Basin and towards the south in the Mongolian Plains. Elements of a later Bronze Age with animal-style motifs were found from this Scytho-Siberian epoch. Special animal depictions carved into stone are called “olenniye kamni” today (see picture). In southern Kazakhstan in the Talgar alluvial fan and in the high valleys of the Turgen and the Asi rivers in the Tien Shan mountains, finds in settlements and grave sites show that this handicraft was known and traded in the Bronze Age and early Iron Age. An isolated mound of stones at the tip of the Beiram Pass in the Altai Mountains (Beiram Mound) as well as in western Mongolia revealed such handicraft. Handicraft was traded and treated by various nomadic clans from the 5th century BC until today. This includes the Manchu, though their handicrafts show stronger ties to the Chinese flatlands. A complex and idiosyncratic culturaldevelopment of this Scytho-Siberian era in combination with a Sauromatian and Sarmatian community is currently being revealed in the areas of Kazakhstan, Siberia and Central Asia. It is becoming apparent that our knowledge about large areas precludes any interpretation of a unity of the whole Eurasian steppe. Handicraft was only traded and treated far across ethnic boundaries. 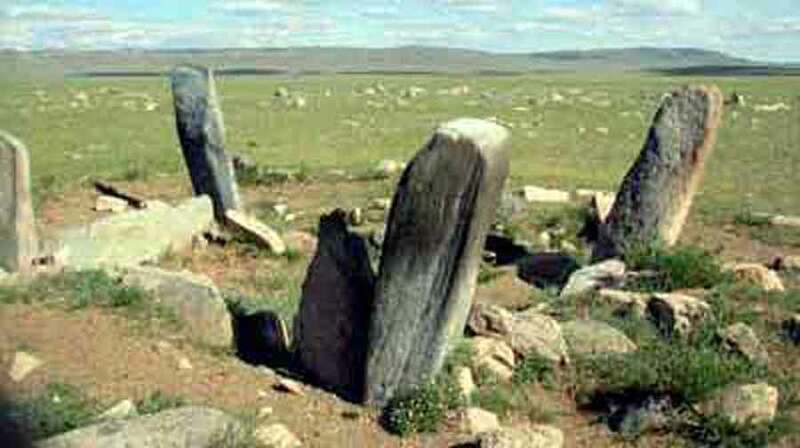 - For more information see also „Beiram Mound“ in West Mongolia. Migrations of small groups with settlements probably contributed in part to the development of cultural similarities. A cultural horizon can be traced back to this fact, which cannot be seen as a unity but must instead be considered a Eurasian cultural continuity of a Scythian epoch. Neighboring cultures were similar but retained their independence. Global processes enhanced transregional communication but no more than that. A social hierarchy as a key of reflections played an important role in the communities with individual hierarchies and showed their status mainly within burial rituals. In addition to this there is the large number of constructions of grave sites, the locations within burial caves, the combination of burial rooms, the richness and multitude of grave offerings with animal and human sacrifices as well as weapons, jewelry, transportable carved stone or clay altars, objects with animal-style motifs etc. The status of the deceased could be recognized and with what they were equipped for their ride into the new world (the belief in reincarnation). Leaders, priests, priestesses or warriors, royal interments of the elite as opposed to the people were easily recognizable by the grave offerings and their social relevance. The clans of the early Iron Age were good warriors, organized in a patriarchal manner, which could be recognized in the steppes. Women also had to engage in hard labor as well as daily chores. They also held positions as leaders, priestesses, warriors and warrior-priestesses. Graves with grave offerings probably reflect a picture of these Iron Age communities. Burials of a selected group or subgroup of the population allow assumptions regarding the whole of a living community. In Eurasia information in the form of organic materials was lost that would have represented an important component within the choice of grave offerings. More was found in Central Asia because the permafrost supported conservation. A nomadic cycle is also important for the understanding of how these mobile shepherds that moved around the countryside went about their daily lives. These relationships can most certainly be traced back to a whole cosmology or their religious practices. The way in which these early groups transported their rituals in burials is related to the materials they integrated (i.e. skeletal comparisons, remains, pottery, weaponry, etc.). The important social elements, such as wealth, power and cosmology, can be seen within these burial patterns. It can be seen from the dead, which part the ritual processes of the living, their structures of age and gender and their diet played. "Fenno-Scandinavia", or Fennoscandia (Lapland*) is a geographical and geological term which applies to the Scandinavian peninsula, the Kola peninsula, Karelia and Finland, whose population is called the Sami people. *The syllable “Lap” is explained in the dictionary with “lapponicum” and “Fenni” in classic Roman and Greek writings. Since prehistoric times, long before national borders applied, groups settled in arctic Europe, which today extends over Norway, Sweden, Finland and the Russian Kola peninsula. They have settled in the northern arctic and subarctic regions for 5000 years. The Sami are counted as arctic peoples. Petroglyphs and archaeological finds were found in settlements from a time around 10'000 BC. The “Komsa” (Sami) is an old term for this culture of hunters and gatherers of a late Old Stone and Central Stone Age. A cultural continuity existed between people of the Stone Age and the Sami, whose similarity in patterns can be found in objects made of bone. Because of new archaeological finds in the Finnish Lapland, this “Komsa” culture is associated with the original continental settlers that are approximate contemporaries of finds at the southern coast of Norway. It is assumed that they followed the retreat of the glaciers from the arctic coast at the end of the last Ice Age (beween 11'000 and 8'000 BC) and settled here on new soil, i.e. in Finnmark in the northeast and on the coast of the Kola peninsula. They were the earliest settlers in the region and can therefore be considered the indigenous population. 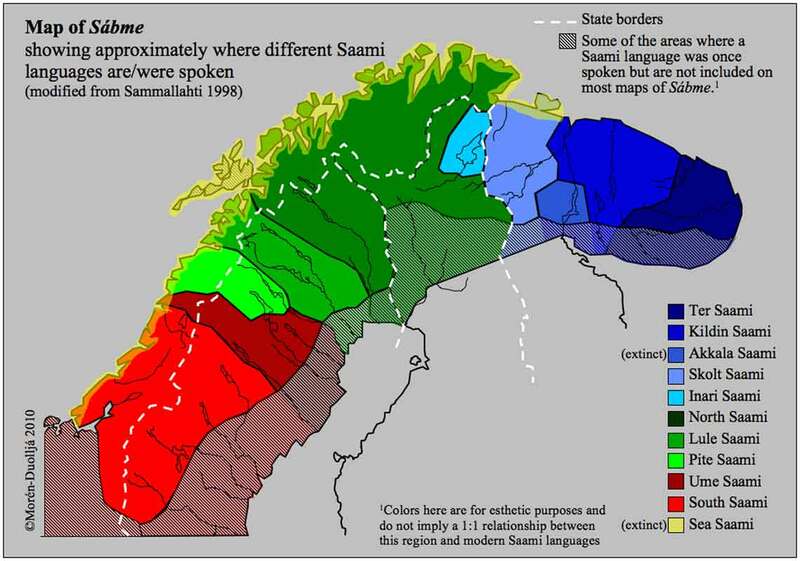 Sami belong to the arctic indigenous people of the area of Säpmi (see map) today. Their traditional language (see map), is the Sami language that is associated with the Finno-Ugrian branch of the Ural language family and is closely related to the Baltic-Sea Finnish languages that are related to Estonian. They traditionally settled close to the ocean, along the fjords of Norway and their inland waterways. They ate the products of agriculture with cattle, sheep, traplaying and fish. A minority that settled in the nearby mountains specialized in the hunting of wild reindeer and began to domesticate them in herds. The traditional Sami religion showed a variation of beliefs and practices between the clans on and around the island in the shap of animism and the belief in a higher power. Their spirituality is often connected with pantheonism, with a strong focus on personal spirituality and a connection with daily life. A connection between natural and spiritual worlds is formed. Besides other functions within a community the Sami shamans or noiadis also conducted direct communication with otherworldly powers but they nevertheless also used drums, singing and worldly objects during their rituals. Some practices within the Sami religions were of course connected with holy sites such as mountains, springs or certain land forms to which sacrifices were made. Petroglyphs or labyrinths point to this kind of mystical places. One of many important elements of the Sami culture is the Joik*, a legend presented in the Sami language, their huts and tents, popular medicine, traditional costumes, the use of reindeer sleighs for transport, the production of carved objects and their knowledge of ecology and nature. *Joik is the original Sami music that consists of rhythmically sung poems or poetically presented songs and makes up an integral part of the old Sami religion of shamanism. As a cultural method of expression it shows great variety, and the singer can improvise on a theme. Some of the most popular types of Joik are those which can be ascribed to a particular person. A far eastern migration of a Finno-Ugrian speaking clan can be found at the river Ob, near the Ural. In West Siberia the Samoyeds settled, hunters that speak a similar Finno-Ugrian language and live off of reindeer breeding. They practice a similar shaman cosmology that still exists today. The origin of the Sami therefore remains a mystery, even though the Finno-Ugrian language of the Sami can be associated with one of these Ural language families because they do not share the same genetic data with these Ugrian peoples. Studies confirm that the males are more closely related to the hunters of Siberia than the women, who mainly share a genetic code with the other peoples of Europe. Archaeological finds also show that the Sami rather belong to the indigenous peoples within Europe that settled here before the Indo-European clans immigrated. Blood studies show that they share a unique blood type A2 with the indigenous people of Polynesia in the Pacific! Scientists believe today that the Sami evolved from fishermen and hunters that live along the border of the melting inland ice in Europe towards the end of the last Ice Age around 13'000 BC. Around 10'000 BC the ice began to retreat, and with it the majority of the hunter-gatherers migrated east and then north. A smaller group followed the narrow coast of Norway north. These two groups were separated by a gigantic ice barrier, which may have been the reason for the genetic difference between the Sami and the Ural group. Around 8'000 BC, the ice had completely melted and the people from Norway eventually came into contact with those that had settled in Russia. From approximately 6'000 BC a common culture had developed in this arctic region in the north, in which an eastern Finno-Ugrian language and a Sami language developed to that of today. 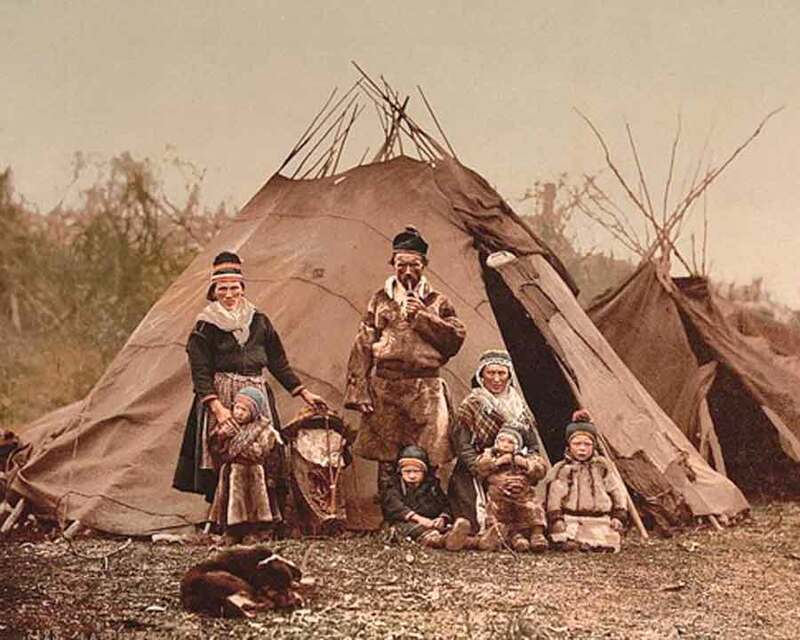 - A Sami family (see photo), Norway around 1900 (from Wikipedia  the free encyclopedia). Archaeological finds have shown that contacts between the Fenno-Scandinavian (Lapland) and the Siberian area existed in the first millennium BC. A parallel basic knowledge of reindeer breeding existed in this northern area at that time. It seems obvious that mythological motifs can be found between the pre-Christian Sami communities and similar beliefs in the nomadic horse-breeding group in the eastern steppe. Finds contain such “Ruto” motifs (Sami Ruto cult). A mythological rider on a horse reigns over the world of the dead. Handicrafts from Scandinavia and West Siberia have confirmed such long-standing contacts. Reindeer gear consisted mainly of organic materials such as bones, wood or leather and was found well preserved in peat or permafrost. But reindeer breeding with large herds required new grazing grounds to have enough food. The development from a sedentary hunting community with the keeping of domesticated animals with agriculture and settlement structures could not be continued. These reindeer hunters had contacts with cattle breeding nomads, farmers and metal workers in the Eurasian and Siberian areas. They played an important role in influencing the transfer from gathering communities to field agriculture and migrations with large herds. Social similarities and ideological beliefs influenced each other over great distances. Fennoscandia can be considered the farthest western part in the north of the “Stone Age Worlds”, its neighbors were proto-Germanic (1). The area was also inhabited by Northern European peoples. 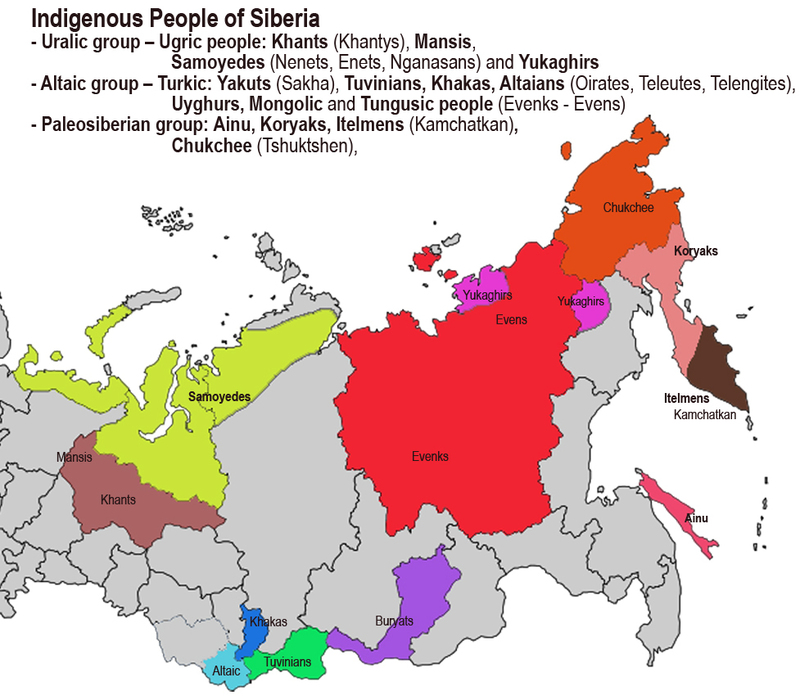 Contacts to Siberia existed even around the 8th and 7th centuries BC with an existing economic and cultural civilization, which led to changes, particularly through relationships with the Ananino Culture (2), whose metallurgic centers were located in the east. Reindeer breeding was probably introduced in Siberia during the first millennium BC but this kind of reindeer nomadism probably only developed much later. The Roman author Tacitus described in his book “De origine et situ Germanorum” around 98 BC that the northern clans that he called “Fenni” lived off of hunting during the first century BC. Towards the end of the first millennium BC, a diminishment of settlements in the steppes in the southern Ural and an increase of such settlements in the forest steppes can be noticed. Until the middle of the first millennium AD a strong development of iron working and metallurgy had taken place in the forest steppes, and these were also introduced in the West Siberian forest steppes. A parallel development may have taken place in northern Fennoscandia. Hunting and fishing with settlements was found along the coast and around lakes and rivers; animals in these areas were natural resources until about 400 AD. These settlements were mainly located around rivers and lakes that were water transport routes and important for contacts. Fish was an important source of nourishment and trade. Settlement were also built farther away from rivers and lakes and could be found in forests near swamps and minor sweet waters. The newer economic strategies focused more on interactions with neighboring farming communities (cattle breeding and agriculture). Reindeer hunting and small pelts were important for trade and as an ecological basis between the Sami communities and the neighboring peoples. Reindeer ranching probably did not develop until the Viking period (3). The transportable tents were located close to reindeer summer grazing areas. The largest amount of the permanent settlements with pit traps for wild reindeer have diverse geographical patterns. A pit trap system was normally used in the valleys where the reindeer migrated between the summer and winter pastures. 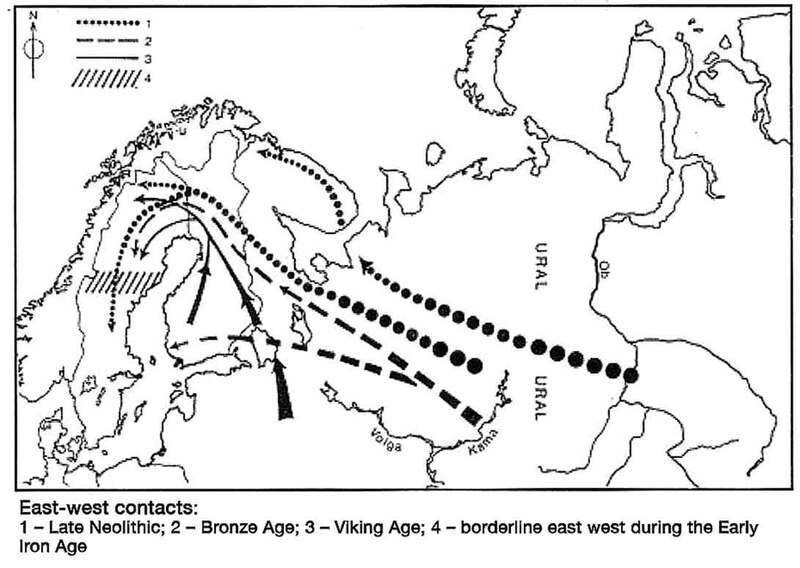 Contacts with the east fall far back, and contacts to the south and southeast only developed during the Viking period (800 to 1050 AD) through migrations to more distant pastures. The Greek historian Procopius reported a war between Romans and Goths in 555 AD. He refers to Scandinavia as “Thule”, and among its inhabitants was a people that he called the “Skridfinns”. Paulus Dianous also mentions the “skridfinns” as hunters and skiers that domesticated similar animals (reindeer) around 750 AD. The Icelandic sagas confirm these observations. In the 13th century legends from the 10th until the 13th centuries AD report of traders that negotiated with the Sami about the buying and selling of wares and taxes. Animal skins were the most popular items of trade at the time, whereas during the earlier Viking period and later in the Dark Ages, furs were more popular among the northern peoples. A source for stories about the Sami from prehistoric times are the writings of Ottar from the end of the ninth century AD. Ottar, who probably comes from Malanga in North Norway, served at the court of the English king Alfred the Great. His descriptions from his home at the time of King Alfred is probably an Anglo-Saxon version of Orosius’s “Stories of the World”. Ottar reports that he kept 800 reindeer and several decoy animals that were particularly valuable, but his most important source of inflow were taxes. In 1763, Johannes Schefferus published the book “Lapponia” which contains information about the life of the Sami. Changes were related to population growth within the originally sedentary groups through an increasing need for nourishment. Climatic changes may also have contributed to the move and building of new settlements. Specific requirements of an economic and social development led to the domestication and training of reindeer for transport. New practices with herds with regard to migration developed. A change from hunting and fishing to reindeer breeding and a nomadic life style started in Scandinavia before it did in Siberia. Adjustments to the river and lake resources were of great importance in the north. The change of the settlement structure around 400 AD led to the change of the existing tradition, reindeer breeding and agriculture. At the end of the first millennium BC and with the start of the first millennium AD an era ended that supported economic growth and contacts with neighboring clans. The influence of clans decreased. 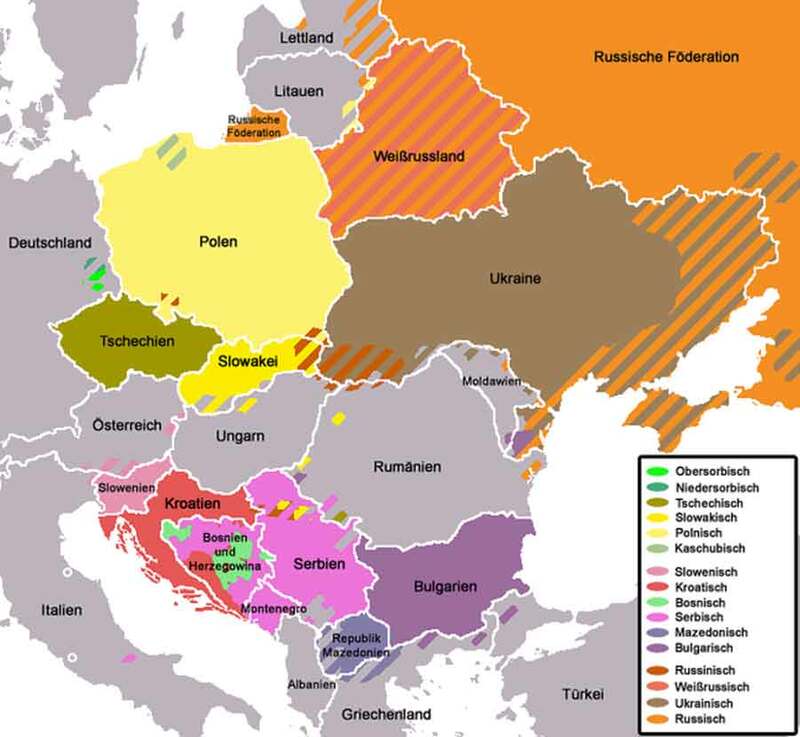 (1) Germani are a number of clans of mixed ethnicity in Central Europe and southern Scandinavia whose identity has been traditionally defined by researchers through their language. A certain modulation was defining compared to the reconstructed Indo-European language family (see map) that is considered the first Germanic Sound Shift. From the Nativity, the contact with the Romans defined the Germanic world as well as the development of the Roman Empire that connected increasingly with the Germanic world. In the late Antiquity, the migration of the peoples resulted in large groups of several Germanic clans that partially formed larger communities (ethnogenesis  the development of a people), and finally led to the decline of the Roman Empire. Several of these groups founded empires based on the Roman model in the previous West Empire that disintegrated in 476/80 AD. Elements of the Germanic religion and its practices were transferred into Christianity by way of missionaries. (2) The Ananino culture (ca. 800 to 300 BC) is an archaeological term for the Iron Age in the region of the middle Volga (from the river Vetluga up to the city of Ulyanowsky) and in the basin of the Kama river. Remains can even be found near Birsk and farther north at Petshona. In the Volga region and the lower Kama area the traces reach as far as the 6th, in other areas into the 3rd and 2nd century BC. Human settlements in Tatarstan dates back to the Paleolithic period. Remains of several cultures of the Stone and Bronze Ages have been discovered within Tatarstan. During the Iron Age (8th until 2nd centuries BC), the Ananino culture, probably a Finno-Ugrian people, dominated the area of the upper Volga and Kama river valleys. From the middle of the 1st millennium BC western Tatarstan was occupied by the Gorodets culture. From the 4th century BC, much of the Volga-Kama basin was occupied by tribes of the Imänkiskä culture, who are thought to have been related to the Scythians, speakers of one of the Indo-European languages. Around the beginning of the 1st century BC a new group, the socalled Pyanobor culture (probably of Finnic origin) appeared at the lower Kama. During the great migrations of the Siberian Turkic and Ugric tribes settled the region east of the middle Volga and forced out the Pyanobor culture from the Kama basin. The Pyanobor tribes lingered on in what are now the north and northwestern parts of Tatarstan. 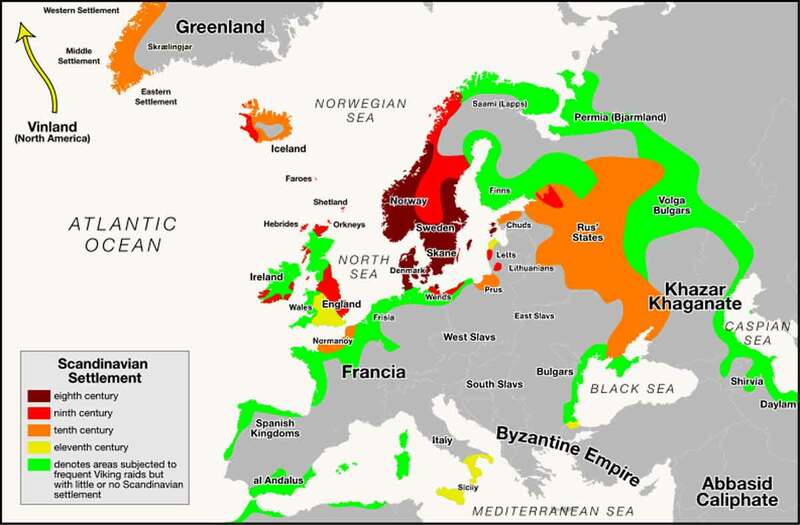 (3) The Vikings are members of martial seafaring groups of mostly Germanic peoples (including a few Balts from the North Sea and Baltic Sea areas). “Vikings” was never an ethnical name. In a contemporary sense, the Vikings were only a very small part of the Scandinavian population. Two groups of them can be differentiated: One type engaged in near-shore robbery temporarily, during an early period of their lives. These were young men who cut their ties to the homeland and sought glory, wealth and adventure afar. Later they settled down like their ancestors and pursued the business common in their area. The sagas (ancient Norse literature) and rune stones report their fates. The other type made near-shore robbery their raison d’être. They are mostly described in Franconian and Anglo-Saxon chronicles. They never returned to their homelands and could no longer be included into their home societies, but were fought against as criminals. The Viking period in the Scandinavian area is defined differently by different researchers. The earliest starting point is said to be the military expedition of Hygelac from Denmark between 516 and 522 AD. More typically, however, the attack on Lindisfarne in 793 AD is characterized as the beginning of the Viking period. 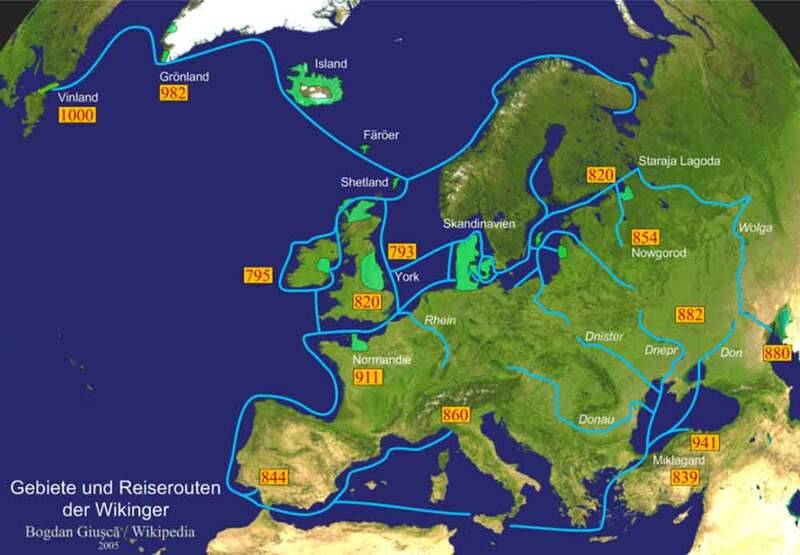 Its end is dated to 1066 AD, whereas the beachcomber nuisance took place earlier (see map of Viking travels and settlements). The Viking period was characterized by a comprehensive network of friendships, i.e. by connections established through the ritual exchange of presents, entailing obligations, tying the individual to the family and involving extensive ancestor cult but also confrontation with Christianity. As they went along, small rulers were increasingly replaced by central authorities. Advanced shipbuilding and the mobility associated with it in both war and commerce brought about wealth and cultural flourishing. Some authors use the term “Viking period” for the history of the Rus’ people. This is due to the fact that many cultural developments in the Viking period had their focus in the Baltic Sea area. - Rus (Eastern Slavic, Latin: Ruthenia) is a historical term used for a territory in Eastern Europe, in which the Eastern Slavs were originally at home. The name is derived from the Rus’ people, who are believed to be of Norman descent and navigated the rivers of this region (Old Norse: “Gardarike”) during the 2nd half of the 1st millennium AD. The name is generally deduced from the Norse “roör” (= “oar, oarsmen”). The first state in this territory was the Kievan Rus, which flourished during the 11th century. In modern Russian, the term is also used as a literary synomym of Russia that comprises Ukraine and Belarus. There are various theories about the Rus’ origin. One of the most common theories is the Norman theory, according to which the Rus’ were related to peoples in the Swedish area called the Varangians, who, as deduced from finds dated back to the 7th through 9th centuries AD, settled in Latvia and, at the brink of the Viking area, in Staraya Ladoga (founded around 750 AD) and immigrated into the northwest of Russia. Within less than a century, they expanded towards the southeast (according to Bertiniani’s chronicles of 839 AD) until they reached the borders of the Byzantine Empire (820 until 912 AD). Treasures found in Staraya Ladoga contain oriental coins and Scandinavian finds from the time around 750 AD, suggesting that eastward travelers had already gained access to oriental silver at that time. Several Scandinavian cemeteries with flat graves and fields with tumuli were found in Grobina, Latvia, as well, including fire burials from the Vendel era (the name of an epoch of early Swedish history between 550 and 800 AD). The Rus’ and the Varangians play an outstanding role in the Russian Primary Chronicle, where Rus’ is either the name of a people or that of the social stratum in power. As a consequence, Rus also became the name of the territory, in analogy to designations like “Bohemia” or “Hungary”. 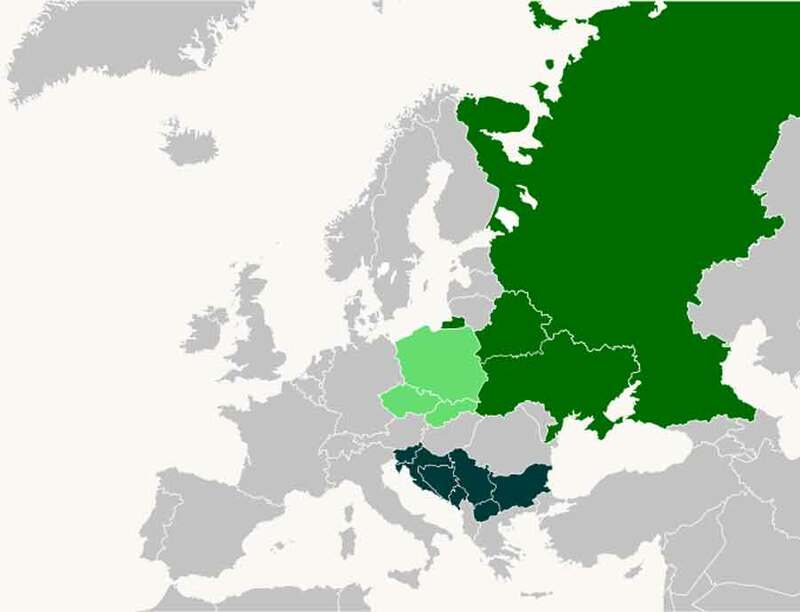 The Slavs are a group of peoples who speak a Slavic language and settled mainly in Eastern Central Europe, Eastern Europe and Southeastern Europe. Slavic languages were, next to Germanic, Romanic and Celtic languages, one of the main groups of the Indo-European language family in Europe. Researchers still have not found the Slavs’ original territory. 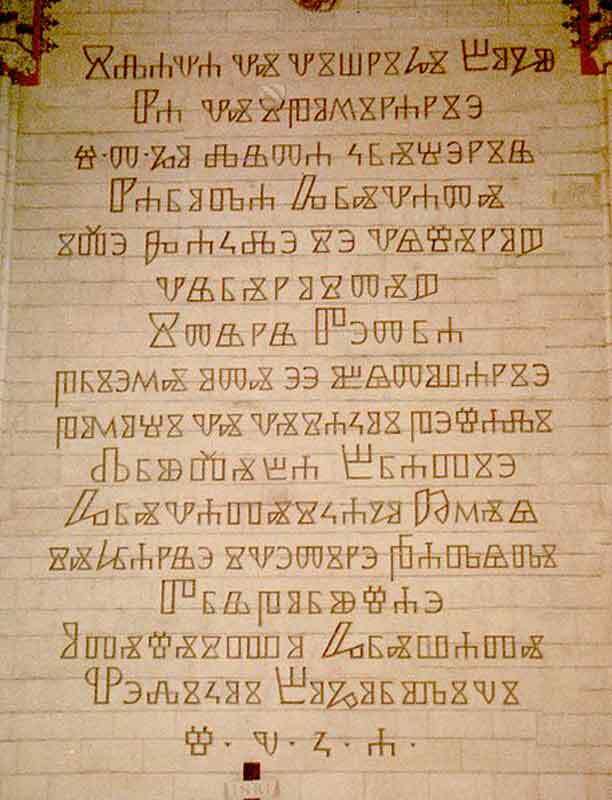 As the Slavic script was not developed before the 9th century AD (Glagolithic script), and the early Slavs lived outside the alphabetized civilization, written documents about them are rare. Initially, the Vends settled at the river Vistula, the Slavs settled between the rivers Vistula and Danube, and the Antes settled between the rivers Dniester and Don. The various tribes were undermined or displaced by the Goths. Eastern Roman sources report numerous Slavs and Antes invading the Danube provinces of the Eastern Roman Empire from the Carpathian Mountains, the lower Danube and the Black Sea areas during the 6th century AD. It is mainly Polish and Czech scholars who believe that the pre-historic Slavs are identical to the Lausatian culture, but this is heavily disputed by other. Only with their mention in the Eastern Roman sources do the Slavs became tangible as a historically relevant entity, even though these groups, while being perceived as such from the outside, hardly appeared as an ethnically homogenous assembly. Newly formed large associations during the mass migration period were usually fragile and polyethnical, i.e. they were made up of people and groups of different origin, who were held together only by their belief in a common ideology, future and culture as well as their common descent, without necessarily deriving from the same culture or language. 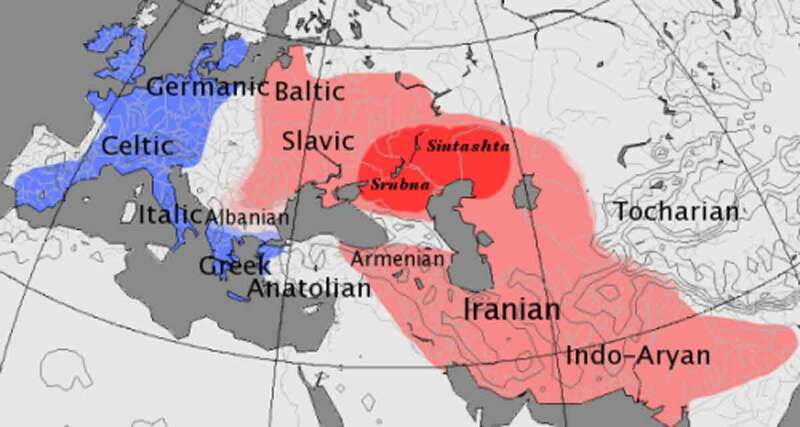 Ethnogenesis is a historical process, which eventually produced the historically tangible “people” called the Slavs. For the emergence of the Slavic language (topogenesis), a territory between the central Vistula, or Bug, and the central Dnieper could be found. However, it was not only the migrations of the carriers of this language but also the assimilation of people of different origin that resulted in a “Slavization” in Eastern Central and Eastern Europe. As a historical people, the Slavs first appeared by the name of the Serbs (Spores) and the Venetians, names by which they resided in countries between the Baltic and the Black Seas, between the Carpathian Mountains and the Don, from the upper Volga to Novgorod and from there to the place where Vistula and Oder separate, until the 5th century AD. Starting with the 6th century AD, the names Antes (for the Eastern Slavs, though the historical Antes people probably were not even Slavic) and, for some Western Slavs, Sloveni appeared. Both did not last long as generic terms, as the name Serbs was narrowed down to refer to specific Slavic tribes. The designation “Venetians”, however, became “Vends”, as the Slavs in Germany were called (today: the Sorbs). The name Slavs has been common at least since the early Middle Ages. Adam of Bremen referred to them as the Sclavi in his chronicle of the Archdiocese of Hamburg. - The Varangians were Scandinavian armed male societies tied together in particular by oaths and shared commercial interests, who were active between the 8th and 12th centuries AD in the Baltic area and Eastern Europe. They used large rivers like the Volkhov, the Neva, the Daugava, the Volga, the Dnieper and the Don, to move forward in the Eastern European lowlands. The Varangians appeared as merchants, warriors and settlers. On their mercantile expeditions on the Black Sea, they reached Constantinople, where they served as life guards of the Eastern Roman emperor for some time (Varangian guards). They even came to Baghdad via the Caspian Sea. Even the life guards of Russian dukes, the Druzhinas, are derived from Varangian sworn communities. The Varangians also participated in the foundation of the Kievan Rus’ empire. From the 9th century AD onwards, they settled, first as soldiers, than as the nobility and leading class among the Eastern Slavs. The Scandinavians residing in Russia were completely Slavized by the end of the 10th century AD. From now on, they were no longer referred to as Varangians (Russian: “Varyagi”) because the word “Varangian” meant strangers, never locals or included people. Until the 5th century AD, migrations had taken place within the upper region of the Pannonian steppe and in the north. The first migrants were the Vandals (1) around 401 AD, followed by Alaric, king of the western Goths and ruler of the Germans, who conquered Rome, but also by the Gothic general Radagaisus around 405 AD. The Huns and their allies, the Scythians, invaded the lower Danube area around 408 AD, defeated the local population and enslaved those they defeated. The pressure decreased, and around 420 AD, large parts of the Pannonian steppe were controlled by the invading tribes. (1) The Vandals are a Germanic people classified as part of the Eastern Germanic language group. At Tacitus’s times, they first settled in the northeastern “Germania” but later continued to expand, and in course of the mass migration of the 5th century, a majority of them emigrated to Spain and finally to North Africa. 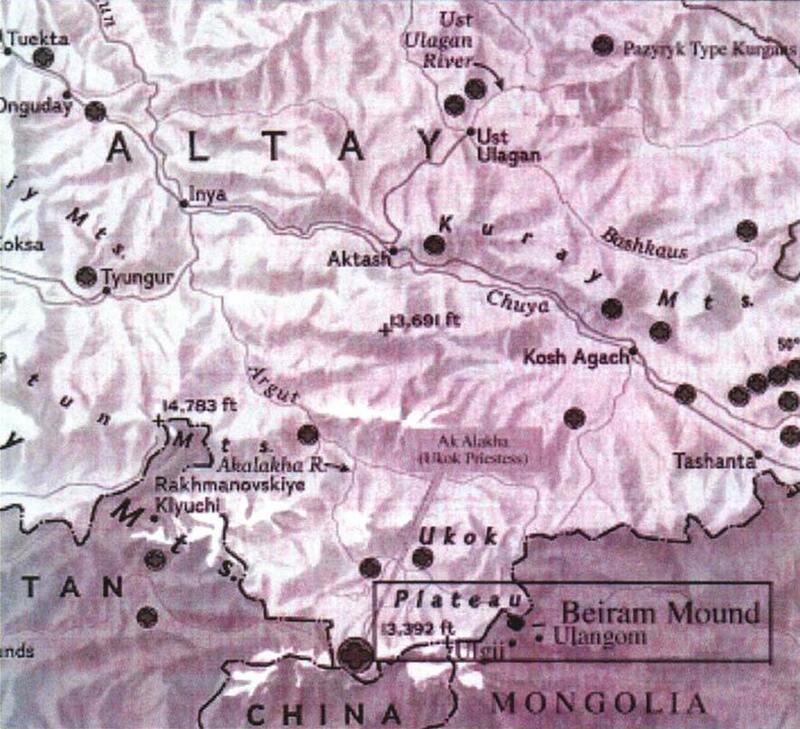 Their traces are lost after the destruction of the Vandal empire by Eastern Roman troupes in the 6th century (see map). From the 3rd century AD onwards, it became increasingly difficult for the Roman Empire to keep up its political authority and to organize the border territories; the Romans had to re-promote the contacts and relationships with neighboring civilizations in order to stabilize their political power in Europe. Peoples invaded the European territory, built settlements and settled down. Germanic tribes appeared at the north coast of the Black Sea during the first half of the 3rd century AD and brought changes to existing structures. Before that, this region was controlled by the Kimmerians, who settled at the Bosphorus. Here they had built a kingdom with Alanic and Sarmatian tribes and founded their own villages. They dwelled in unfired clay houses fixed with stone plates, they pursued animal husbandry and agriculture, were familiar with metallurgy and produced their own ceramic goods. 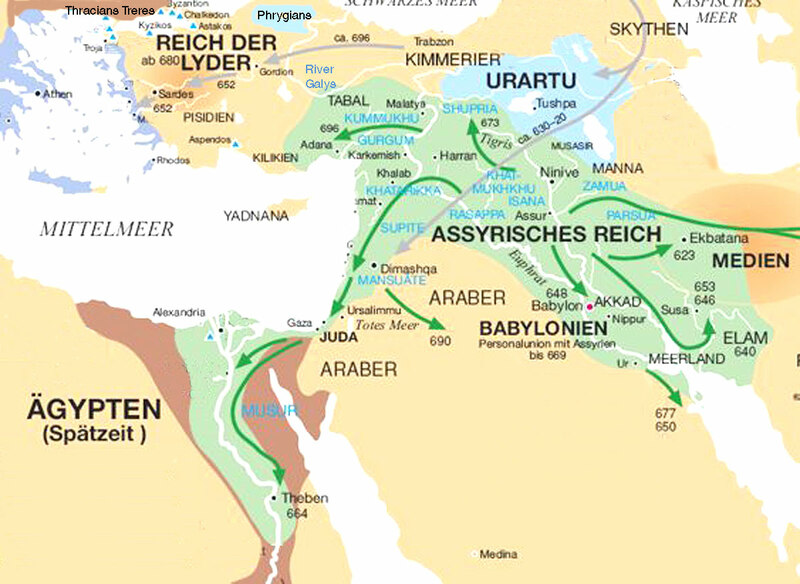 During the 2nd half of the 3rd century AD, Germanic tribes together with the Alans increased the settlement pressure and migrated into the Kimmerians’ territory. As a result, enormous population growth determined every-day life and brought new customs, art forms and clothes for both men and women. 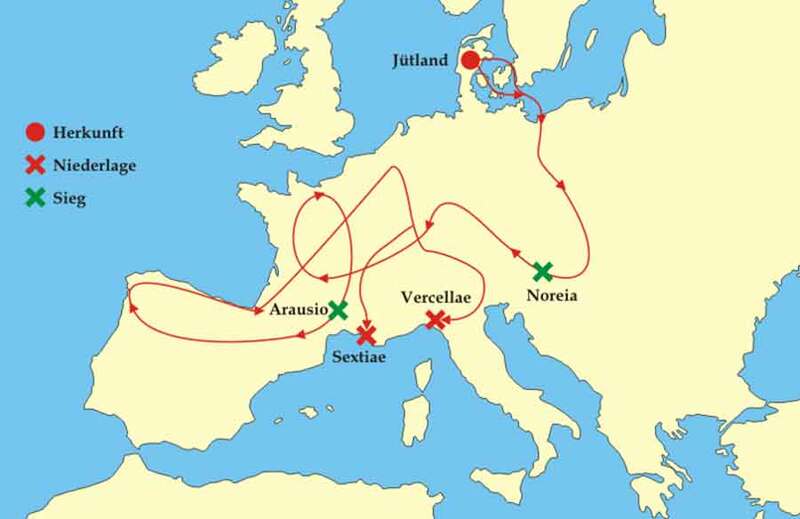 Mass migrations: Many authors associate the migrations during the 3rd through 6th centuries AD with the subsequent Norman migrations during the 8th and 9th centuries. They speak of a “sea mass migration”. The increasing weakness of the Christian-Franconian empire following the death of Charles I. encouraged the Normans to take up the fight against western Europe, and they were able once again to pool all strengths of the formerly pushed-back paganism. Archaeological finds prove that at the end of the 5th century, and expansion took place from Gotland to the East Baltic area. While the inhabitants from the east oriented their military expeditions mainly towards the west, the people who lived in the territory at Lake Mälaren in Gotland and Öland, preferred to move south and east along the east coast of contemporary Sweden until they reached the Caspian Sea. They sought contact with Arab traders and founded trading venues in Novgorod, Staraya Ladoga and Kiev (see map of the Viking routes). Migrations of the Vandals, the Alans, the Suebi, the Gepidae, the Rugians and the Lombards to the south eventually resulted in the decline of the Roman Empire and the foundation of Germanic rule. Initial fundamental steps to a socio-political tribal confederation were taken between the settlements during the 1st through 6th centuries AD (see map of the mass migrations) based on an exploitation of the grazing grounds, forests and wild animals, and based on contacts with the Romans. During their westward migrations, the immigrated tribes from the east settled between two large waterways, the rivers Volga and Don. A west route from Ukraine and Belarus via the arboreous areas in western Europe already existed. The other, less comfortable routes ran along the lower Danube valley to the Great Hungarian Plain. The western European regions were targets of several successive waves of mass migrations from east to west and from north to south. The Goths, Alans, Sarmatians, Huns, Avars, Bulgarians and Mongolians all played a critical role in the settlement history of Europe between the 8th century BC and the 13th century AD. The Goths (1) initially occupied the northern European planes of the Pannonian marshlands and swamps of the Great Belarussian Plain. Their development began in the north of the North and Baltic Seas, next to the steppe where the peoples of the east settled. Overcrowding had caused migration on extended routes to the south until the planes of the Moldova and the lower Danube rivers. Some even settled on the Crimea. Pressure exerted by the Huns (2) from the east towards the Carpathian region and the heart of the Western Roman Empire increased. Eventually, they passed the entire Iberian Peninsula, which was controlled by the western Gothic kings of Toledo at the time, whose rule ended only with the Islamic victory in 719 AD. After the Huns invaded, they lived in the steppes at the Black Sea and in the Pannonian Basin. In many respects, their life style and 19 cultural world view were similar to those of the nomadic shepherds of the east, who migrated from pasture to pasture with large herds. Some of the tribes had pursued a semi-nomadic life style with minor settlements. This allowed contact with nomadic tribes who lived at the central and lower Volga, and some connections even reached across the Ural Mountains to the Chinese border. Chinese chronicles report that the Alans, the Scythians and the Sarmatians were part of an Indo- European Iranian group, who joined this confederation of tribes after the 1st century AD. They occupied the land between the Don and the Aral Lake, controlling the region north of the Caucasus. Finds confirm that it was from here that tribes embarked on migrations to southern regions and to the west. It is possible, and partly confirmed by texts of Roman chroniclers, that, via the Alans (3), contacts with other steppe peoples existed in the first half of the 1st century AD. This is shown by finds from Alanic kurgans, which exhibited similarities and were regularly equipped with a large entry port (dromos) above the graves and a constructed room for burial objects. Found handicrafts used as burial objects in the 1st and 2nd centuries AD shared many similarities. Until the 2nd half of the 4th century AD, the Alans lived close to the Sea of Azov like nomads with herds. They did not build huts, nor plant crops. They used wagons covered with cattle skin for moving across the endless steppes in clans, migrating from pasture to pasture with their herds. Horses took on an essential role. (1) According to the myth of their origin, the Goths are from the island of Scandza. However, according to earlier research, the Goths left their alleged homeland in South Sweden and/or the island of Gotland around the end of the 2nd century BC, moved across the sea and settled down in the area of modern-day Poland. While the interpretation involving said ur home “urheimat” has found increasing acceptance recently, it does not seem peremptory. It is also possible that the Goths as a polyethnic association were first formed on the soil of what is today Poland. Some assume that the area of contemporary Denmark was the center of the early Germanic civilizations, others place it in South Sweden and North Germany. From here, the Goths spread mainly south and southeast after the mid- and late 2nd millennium BC. After 150 AD, their area of settlement shifted towards the Black Sea. (2) The Huns initially settled in the northern Caucasus region during the 2nd half of the 4th century AD. At an early stage, they interfered with systems of territorial settlement by conquering. There is still no agreement on their initial origin and ethnic features. It is believed that they moved from the Cilician border area to the west across the steppes until they reached the Caucasus at a time between 155 and 160 AD. Scholars suggest a connection between the Huns and the Turks, but have no proof. The Huns subjugated the Alans (3), who settled along the river Don, and the Goths under Hermeric during the rule of emperor Valens. They forced part of the Goths and their allies to flee to the Danube, which they crossed, after which they settled at the border to the Roman provinces. Processes of depopulation and repopulation within groups similar to the Huns brought about Hun rule, which remained steadfast until the first half of the 5th century AD. The Huns, while settling within the area of Roman authority, preferred their simple nomadic life style that included animal husbandry. During the early 5th century AD, Huns settled at the north coast of the Black Sea and on the Crimea, living off of a seasonal pastoral economy. A number of graves with stones in different sizes and covered with soil contained remnants of human an animal cremations with weapons added, including swords, arrowheads and harnesses. - Find further information on the Huns under “Huns  4th century AD through 6th century AD”. (3) Alans: Find further information on the Alans here: “Alans  2nd century BC to 13th century AD”. 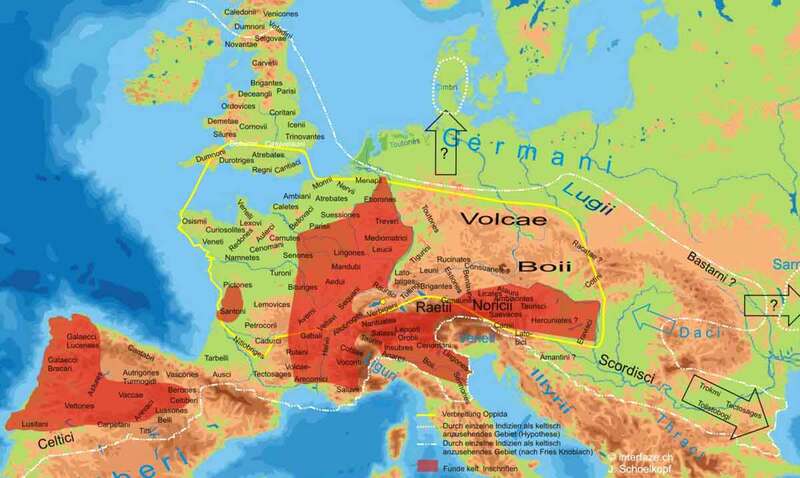 Germanic influences began to displace the Gallo-Roman and Noric-Pannonian civilizations (Noric = Alpine civilization), when Germanic tribes invaded provinces of the Roman Empire in the northern Alps in the early 3rd century AD. Within the province of Pannonia, remains of the Noric-Pannonian civilization survived for a few years, but had disappeared for good by the beginning of the 5th century, when the Roman province of Pannonia was finally conquered by the Huns. During the first half of the 3rd century, the first groups of Germanic tribes reached the north coast of the Black Sea. Gothic tribes followed, occupying the entire territory north and northwest of the Black Sea area. Two separate civilizations developed here: the Ostrogoths and the Visigoths. Their deviating development is clearly visible based on hand-made ceramic products, morphological metal handicrafts and particularly the burial rites. Influences came form local tribes of the Sarmatians and Dacians as well (Thracian people  see map und explanation above) as well as earlier immigrants from archaic civilizations, who settled along the North Sea shore. The Chernyakhov culture in the 2nd half of the 4th century AD was discovered in large cemeteries with typical double burials. The settlements contain handicrafts of various forms, including wrought ironwork, fine potter’s-wheel ceramics with morphological decorations, glass objects with checkered patterns, objects of every-day use, women’s clothing and personal jewelry, such as bone combs, chains with lavalieres and amulets. All of this displays a typically oriental touch. Similar characteristics were also found in Ukrainian settlements, where the huts were arranged in parallel and in series. Thus, a connection across the waterways was indeed possible. Agriculture was well advanced, and barley, sorghum and wheat were sowed at the right time to be able to harvest them in late summer. Husbandry as influenced by nomads also played an important role in their economy. Seasonal migrations searching for better conditions for large herds in terms of climate and geography were necessary. The communities used their knowledge of the land to mark the best paths for their herd migrations and to find suitable territories for seasonal settlement. Note that this is something the Germanic peoples had in common with the isolated groups of Alans and Sarmatians: a development of resident villages with a mixed population, who were dispersed along the north coast of the Black Sea. A second group of Alanic tribes moved south to the Crimea, while a small core kept their semi-nomadic status and went on periodical migrations on limited paths. They sojourned on a narrow stretch of land at the Dniester in the west and the Danube in the east. This has analogies to the Gothic migration from the Baltic region. Events of both historic and cultural importance occurred, as seen from archaeological examinations in a number of villages, which, according to stem cells, can probably be classified as being from the Chernyakhov culture. In addition, excavations revealed remnants of subterranean housings with unfired clay roofs. The population lead a semi-nomadic life style, including agriculture, animal husbandry, metal and ceramic processing. Several excavations on cemeteries have revealed various graves with human burials of Alans and Sarmatian tribes, as well as cremations of Germanic tribe members. Events of this kind confirm that in the second half of the 3rd century AD, a coexistence of different tribes existed, who each had their own burial rites and customs. For example, a large amount of handicrafts were found, which were made by Alans who settled down on the Crimea and founded mixed settlements dispersed along the north coast of the Black Sea. These handicrafts could indicate that the two different peoples pursued a mostly sedentary life style, living off their mechanic skills. A large number of products were found: ovally shaped buckles, miniature bells, harnesses, knives, carnelian necklaces, lucky charms filled with polychromatic glass, and pots. The use of dark clay vessels and double-cone ceramics was an initially Germanic tradition. Various forms of Roman amphoras were also found, and local imitations were common. The Suebi were the first to influence the enthnographical perception and description of many Germanic tribes in the ancient world by their tradition and appearance. This dominance was later transferred to the Gothic tribes. During the late Antiquity, the term “Germanic” was still only used for the tribes settling in Germanic territories, while the large migrating (Eastern Germanic) tribes each had their own identity (Goths, Vandals, etc.). The Scandinavians were not classified as Germanic. Many historians regard the Marcomannic Wars as forerunners of the great mass migration. The increasing population pressure on the Roman borders was most probably caused by the migration of the Goths to the Black Sea and that of the Vandals towards the river Danube. The causes of this emerging migratory movement of Germanic tribes are yet to be determined, though famines are one possible reason. The name “Germanic” was initially used for small peoples in the Belgian and Lower-Rhine area on both sides of the Rhine. Prior to Caesar’s conquest, these peoples were outside the perception threshold of ancient observers, who, when they first learned of their existence, believed they were Celts (see map 1 and map 2). 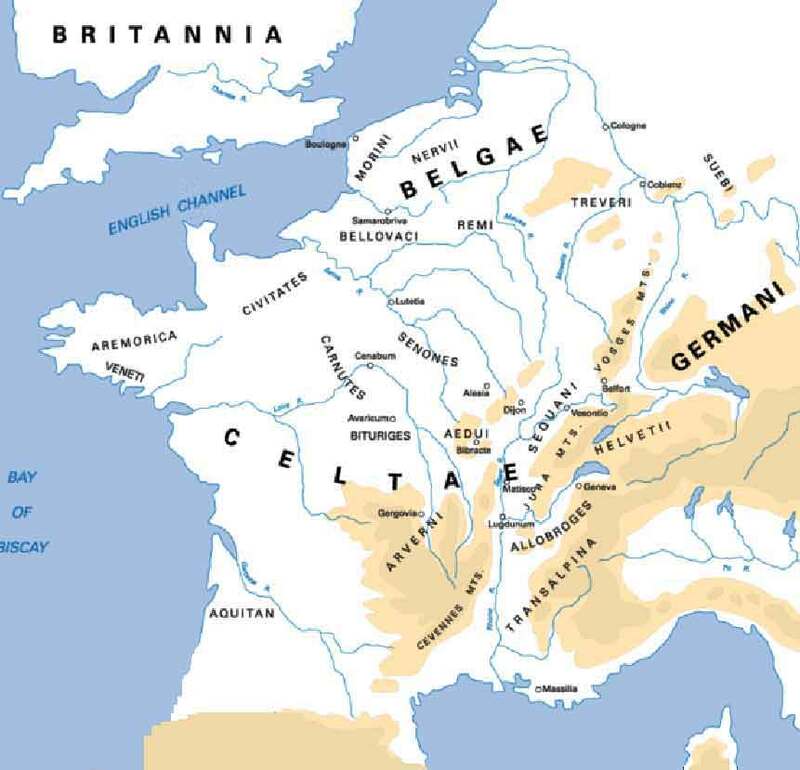 Celts and Gauls: The term “Gauls” is an umbrella term for the Celtic tribes within the territory of Gaul (which corresponds approximately to what is now France, Belgium and the Swiss Plateau). - see map). Close observation is impeded by the almost complete lack of written records of the civilizations perceived as Celtic at a time prior to the Romanization of their areas of settlement. Thus, all knowledge about early Celtic civilizations is mainly derived from archaeological finds and a few generic reports of Greek and Roman chroniclers. Earlier information on the civilization and trade relationships of the Celts is taken from extremely well-equipped tumuli from the late Hallstatt and early La Tène periods (see map 1 and map 2). These so-called magnificent tombs or princely tombs are burial sites of deceased people of high social rank and thus bear an abundance of burial objects. For writing, they used the Iberian, Etruscan and Latin scripts next to their own scripts of Gallic, Celtiberian and Lepontine. The druids were the intellectually and religiously educated upper class in the Celtic social system. It is certain that the Celts never represented a closed ethnicity, i.e. a closed people (ethnogenesis), at best they were numerous different ethnic groups with similar cultures. However, there was no Germanic nation either at the time, only Germanic-speaking tribes sharing cultural similarities that applied to representatives of foreign peoples as well, as described, for example, by Tacitus in his “Germania”. The Celtic language is an Indo-European language group of its own, while archaeologists have identified common cultural features during the mid- and late Iron Age (between 800 and about 50 BC) in Celtic tribes in Central Europe, ranging from the north of Spain to Bohemia. The Celts are associated with the Hallstatt and La Tène cultures. The continuous development from the resident Bronze-Age civilizations of Central Europe, in particular that of the late-Bronze-Age Urnfield culture, is proven beyond doubt today, against all earlier speculations. They are named after the Hallstatt cemetery at the Hallstatt Lake in Austria and archaeological site of La Tène at the Lake Neuchâtel, respectively (see map of Hallstatt and La Tène cultures). 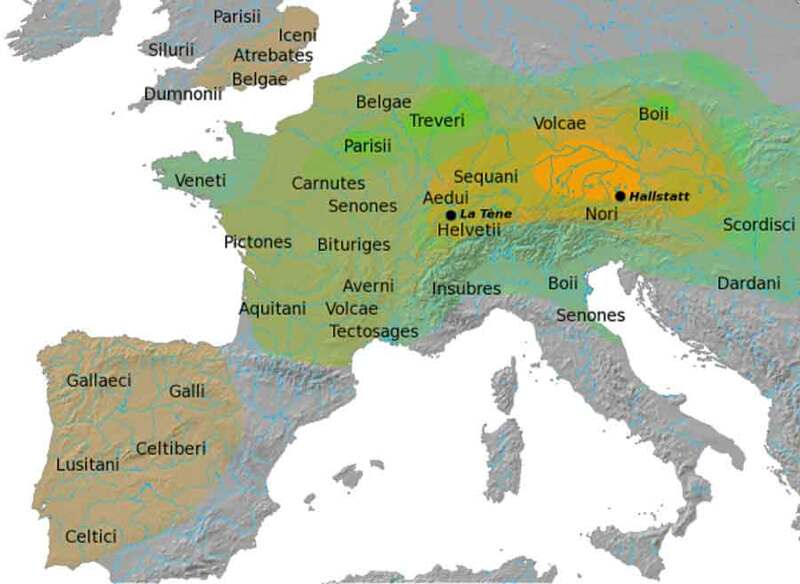 The Helvetii were a Celtic people occupying the Swiss plateau and the south of today’s Germany during the 1st century BC. Tigurini and Toygenoi, Helvetian tribes, entered history via the Cimbri’s foray in 107 BC. 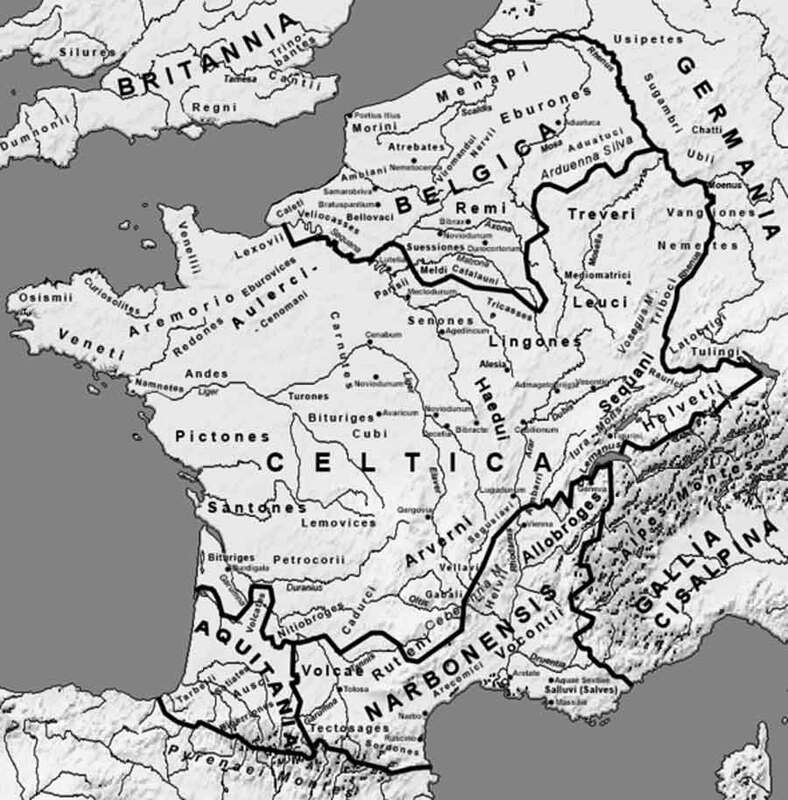 Most reference to the Helvetii is found in Julius Caesar’s reports about his Gallic wars (see map of Gaul at Caesar's time, 58 BC ). After the Romans left in the 5th century, the Helvetii became an important part of the immigrated Alemanni and adopted their dialects. Burial finds from the La Tène period indicate that the Swiss Plateau between Lausanne and Winterthur was occupied at the time. Focal points were in the Aare valley between Thun and Bern, in the area between the Limmat river or the Zurich lake and Reuss. In the Alps, it was the Valais that had an apparently quite dense population, and in Ticino it was the area around Bellinzona and Lugano. 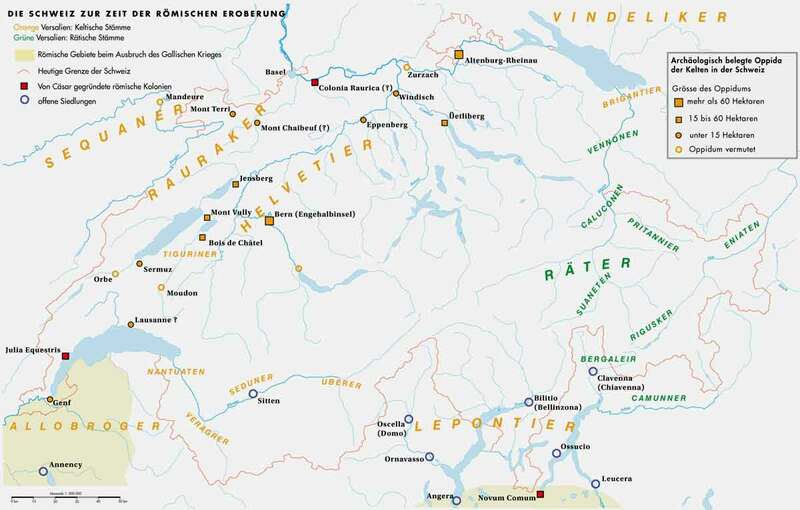 Almost all Celtic oppida (large defended settlements) in the territory of modern Switzerland were located at or close to then navigable rivers (see map „Celtic and Raetian settlements" in the area of modern Switzerland). From an archaeological point of view, the largest extension of the material civilization of the Celts was from South England, North Spain and France in the west to West Hungary, Slovenia and North Croatia in the east; from Northern Italy in the south to the northern edge of the Central German Uplands in the north. Singular finds from the La Tène period are dispersed throughout the Balkans and even Anatolia. These finds are attributable to the Celtic migrations that started in the 4th century BC. The inclusion of Southeastern England in the geographic range of the civilization that is archaeologically designated Celtic is a subject of debate. The archaeological finds from the mid and late Iron Age (approx. 600 BC until about 30 BC) that were found there have regional and local singularities, which differ greatly from contemporaneous finds on the continent. As a result of the Celtic migrations starting in the late 4th century BC, there was also a territory of Gallic settlement in Anatolia (today part of Turkey). Also, some La-Tène-period fibulas were found in the northern Spanish region of Galicia, but not at an extent comparable to a closed Celtic cultural horizon like the La Tène culture. The territory of Central Europe that was Celtic in character was initially adjacent to the Etruscan (1) cultural area in the south and the Greek, the Thracian and the Scythian cultural areas in the east and southeast. Large parts of these areas were later merged in the Roman Empire and its culture. Germanic tribes resided north of the Celtic sphere of influence. The Celts cultivated intense cultural and economical ties with all the above civilizations. According to ancient reports in Roman and Greek sources, however, the cultural technique of exactly passing on oral knowledge within the Celtic tribes was highly advanced. Probably for cultic reasons, the Celts seem to have chosen deliberately to do essentially without written records. Finds from the late La Tène period imply the existence of increasing literacy among the Celtic gentry. The Celtic tribes achieved their greatest extension around 200 BC. In the northwest of their territory of settlement, i.e., in a broad sense, around the northern Great German Uplands on the right side of the Rhine, the Celtic civilization disappeared gradually during the 1st century BC, probably as a result of the progression of Germanic tribes towards the south. (1) The Etruscans (Latin: Etrusci, self-designation: Rasenna) were an ancient people, who settled in northern Central Italy in the area of the modern regions of Tuscany, Umbria and Latium. The Etruscan culture was spparent in this area between 800 and 100 BC. After being subjugated by the Romans (300 until 90 BC), the Etruscans were merged in the Roman Empire. While the Etruscan culture developed only on Etrurian soil, it remains unclear, whether the majority of the population immigrated only immediately prior to the emergence of this culture or not and where the Etruscan language, which would become an essential element of this culture, came from. There were hypotheses about this even during the Antiquity: according to the immigration theory, the Etruscans came from in Lydia in Asia Minor and immigrated into the area of what is today Tuscany after 1000 BC (Herodotus). Modern Etruscology does not inquire about the Etruscans’ origin any more, instead it asks about their emergence as a nation. The starting point of these contemplations is an old Mediterranean social class, who developed a resident farming culture before 1000 BC, incorporating foreign elements from both the east (Phoenician seafarers) and the north (Indo-Europeans). This resulted in the Villanovan culture. This population was then superimposed by a very small layer of immigrants from Asia Minor (Tyrrheni). Mingling with the local population produced the Etruscan people. The earliest evidence of the word “Germanic” are the “Fasti Triumphales” of 222 BC, where Marcus Claudius Marcellus’s victory at Clastidium is referred to as “de Galleis et Germaneis”. At the time, evidently, the Gauls north of the Alps were designated Germani. In his “Naturalis historia”, Pliny the Elder mentions Germani in the Alps. In Rome, the peoples who lived in Central Europe were far from being referred to as Germani. Only in the Roman literature to follow was the beginning of the RomanGermanic confrontation associated with the invasion of the Cimbri (1). At the time of their appearance, the Cimbri were not yet identified as Germanic. Plutarch himself coined the designation “Germanic” for the Cimbri. Typically, however, the Cimbri were believed to be Celts. Together with the Teutoni (2) and the Ambrones they moved south from their area of settlement in the north of Central Europe (Cimbrian Wars). Ancient sources cite a storm surge as the reason for the emigration of the Cimbri, the Teutoni and the Ambrones, but most likely climate change was another one. After a warm period between 2000 and 800 BC, the climate in northern Europe cooled down, producing crop failures and famines, which forced the population to search for fertile land. Their migration towards the south brought them to Bohemia, where they must have encountered the Boii (3), and to Silesia and Moravia, then to the territory of the Scordisci (4) in the Danube/Sava area, and finally to the Eastern Alps, where Norici (5) and Taurisci (6) resided. 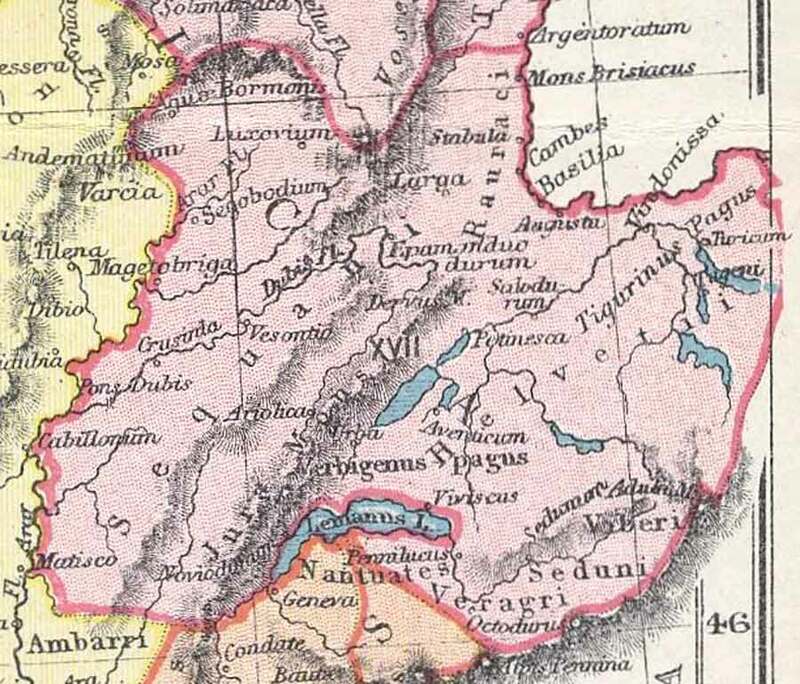 In 113 BC, the Cimbri, the Teutoni and the Ambrones encountered the Romans for the first time in contemporary Styria. Afterwards, the Cimbri, Teutoni and Ambrones moved via Helvetia to Gaul, where they celebrated another victory in 109 BC close to the Italien border. A migration to the west over several years brought the tribes to the Iberian peninsula. (1) Cimbri were a Germanic tribe that presumably came from northern Jutland (more specifically from Cimbri land, which is today: Himmerland in Dänemark - see map. (2) The Teutoni, according to Roman sources, were an ancient Germanic people, who originally lived in contemporary Jutland. The Teutoni emigrated from Jutland around 120 BC, together with the Cimbri, and made it right down to Italy (see Cimbrian Wars). (4) Scordrisci invaded Greece in the 3rd century BC and eventually, after being defeated at Delphi in 279 BC, settled east of Sirmium at the junction of the rivers Danube and Sava. They erected a settlement (an oppidum) near Belgrade. They played an important role in the settlement of Transdanubia. Strabo distinguished between the adjacent Major Scordisci and Minor Scordisci. They are told to have mingled with the local population (Illyrians and Dacians), which is confirmed by the archaeological finds. (5) The Norici were a Celtic or strongly Celticized ancient European tribe in the Kingdom of Noricum (Regnum Noricum) and the subsequent Roman province of the same name. (6) The Taurisci (taur = Celtic for mountain), were a Celtic confederation of tribes at the periphery of the East Alps from the 3rd century until the 1st century BC. Their area of settlement is usually confined to Carinthia and Slovenia. The modern idea of the Germani is based on Caesar’s terminology. In the 19th and 20th centuries the Germani were still perceived as a “people”, based on arguments of linguistic development, such as the Sound Shifts. The archaeological concept of the Germani adopted the linguistic concept: as the spirit of a people (Volksgeist) is expressed in its material creation as well, types of archaeological finds were attributed to existing cultural groups if consistent settlement was detectable and compatible with the ancient sources. Thus, the archaeological concept of the Germani presupposed the linguistic concept, which in turn took the concept from the ancient literature for granted. 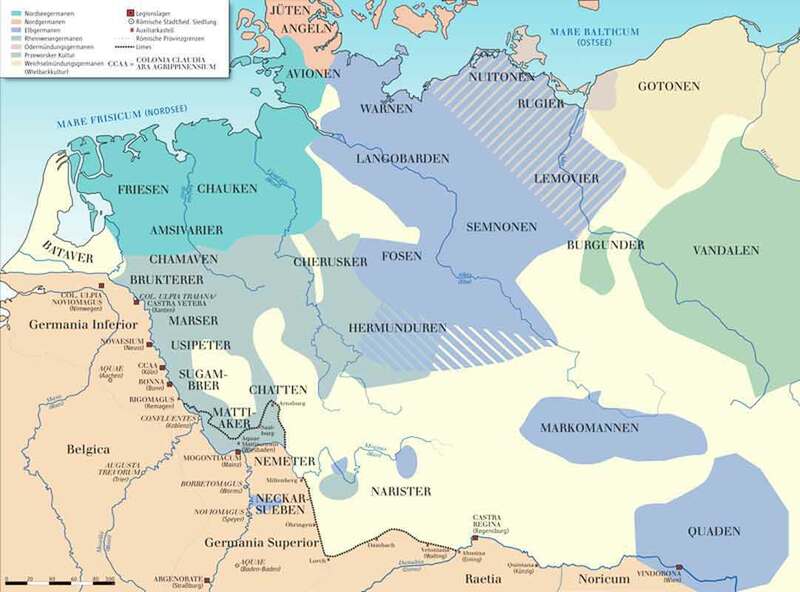 The ancient idea of the Germani, however, excluded the Scandinavian area for obvious reasons of geographical ignorance, while including the Suebi tribes that settled in the area of the Baltic Sea. This concept had dominated after the period of Renaissance humanism. This humanist concept of the Germani was combined with the romantic concept of what constitutes a people and entered the Germanic ideology via the teachings of the national spirit "Volksgeist". An Indo-European ethnicity of early Northern and Central European civilizations, such as the agriculturally skilled Funnel Beaker Culture after 4000 BC, who became a secondary megalithic culture between about 3500 and 2800 BC, is hardly justifiable. What is also contested, is the equalization of the Corded Ware culture (from about 2800 to 2200 BC), also known as Battle Axe culture, with other cultures later proven to be Germanic. Most likely, however, the bearers of this culture were the ancestors of Indo-European language communities. The affiliation of the Nordic Circle (Nordic Bronze Age, about 1800 to 500 BC) to pre-Germanic civilizations is relatively secured. The north of the Margraviate of Brandenburg can also be attributed to this culture, while the south of Brandenburg, Saxonia and Poland belong to the Lusatian culture, which is regarded as Slavic by some authors. Its western neighbor, the Jastorf culture, seems to reflect the expansion of an early Germanic culture and its mingling with the local population; for example, the early-Iron-Age Nienburg culture located in the northwest of Germany was merged in the Jastorf culture. 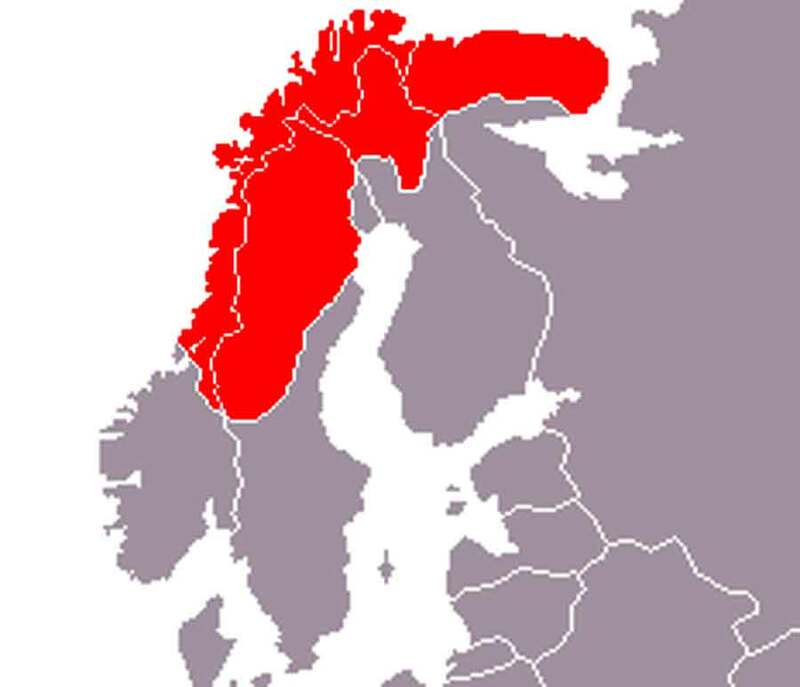 As immigration into the area of the Nordic Circle cannot be detected after the Bronze Age, it is assumed that Germanic was spoken there at the time, at least in part. By the way, emigration during the Iron Age is proven (see map of the civilization of the early Iron Age). Today it is presumed that the predecessors of the Germanic and Celtic languages were a dialect group within the Indo-European languages, and that spatial and cultural separation occurred during the 2nd millennium BC. Similarities in the phonetic system remained. Celtic loanwords in Germanic dictionaries are based on the ever reoccurring cultural contact during the Iron Age around and prior to 500 BC. In particular, they apply to the vocabulary of ruling, commerce and the production of goods. The earliest Germanic insular language recorded in writing is the Gothic language. Unlike the Gothic language, some linguistic records that can be dated back earlier in time, which are found in very brief runic inscriptions that are hard to interprete or, even earlier, in names of people or places, as well as other terms that are retained in ancient sources, generally consist of individual, unrelated references. Germanic records of Germanic scripts begin around 200 AD with the earliest Nordic runic inscriptions. The runes were mainly used as cultic signs, which is demonstrated by the very short and formulaic designs and articulations in weapons (spearheads, swords) or fibulas. The bestknown script bearers are the monumental Scandinavian runic stones. The designations of the individual runes have survived in runic poems. The first actual form of a developed written Germanic language are the Gothic scripts. Originally, the Goths used the common runic script (1) just like other tribes and peoples and, like them, carved them into objects of wood and other materials. The earliest known runic alphabet (called “Futhark” after the first six letters) consisted of 24 signs, which were subdivided into three portions (later referred to as “aettir” in Old Norse). Initially, it was used only by northern Germanic tribes, then, during the mass migration period after the 3rd century AD, occasionally by eastern Germani (in particular by the Goths) and by western Germani after the 5th century. More than 350 inscriptions of this earliest runic alphabet have been discovered so far. All more recent runic alphabets after about 700 AD are derived from the pre-dated Futhark (see runes). (1) Runes are the ancient graphic characters of the Germani. This umbrella term covers characters from various alphabets, whose uses are chronologically and regionally diverse. Many of the ancient civilizations believed their scripts (but rarely their languages) to be inventions or gifts from the gods. There is no doubt that the runes, at least in earlier times, were also associated with religious purposes (tomb inscriptions, signs of offering to gods, in amulets, etc.). Runes can be both individual characters covering individual sounds (alphabetic writing), or signs representing the respective terms whose names they bear. In addition, they can represent numbers or be used as magic signs. With the exception of a brief period in High-Middle-Age Scandinavia, the runic script was not used for every-day communication, and the shapes of the characters did not develop in terms of fluent operative writing. Instead, from the 2nd century until the 14th century AD, runes were used predominantly for carved and engraved inscriptions on objects and stone memorials. Their distribution has had a clear focus on Scandinavia (including Jutland) from the beginning, while in the other areas where Germanic-speaking peoples settled, only sparse scattered heritage is observed, which ends entirely whenever Christianity enters the respective place. The Christianization of Northern Europe resulted in a comprehensive change in favor of the Latin script. The use of runes ended before 700 AD in Central Europe, and during the 10th century in England. 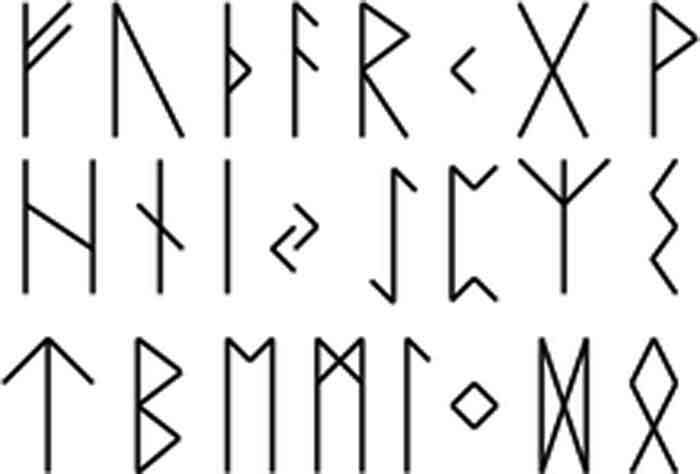 Only the Nordic countries kept up the use of the runic script until the 15th century. 19thcentury runic inscriptions found in the landscape of Dalarna in Central Sweden are mere products of a scholarly tradition and do not evidence any vivid use as a writing system. Runes were used in particular as inscriptions for commemorating the dead or special events, for consecrating objects or giving them away as presents, for indicating ownership and as coin inscriptions. Presumably, the runes emerged neither independently nor as a complete writing system the Germani adopted but were developed largely autonomously based on models of Southern European scripts. Note, however, that they appear considerably early as a complete 24-letter alphabet. Possible models include the Latin script in particular, but also numerous scripts in the Celtic-Alpine-Italian area, which fell into oblivion after being displaced by Latin. Thus, runes, both as a letter script and in the form of many phonograms, can be traced back to the great Phoenician-Aramaic family of scripts, which emerged in the territory of Lebanon and Syria in the 1st millennium BC and is also the mother of all contemporary European scripts. The Aramaic script was developed by the Aramaeans based on the Phoenician script around 900 BC, forming the base for most other Semitic scripts. It was used in the area from Asia Minor to India. For textualization today, descendants of the Script (e.g. Hebrew, Syrian or Mandaean) are used. 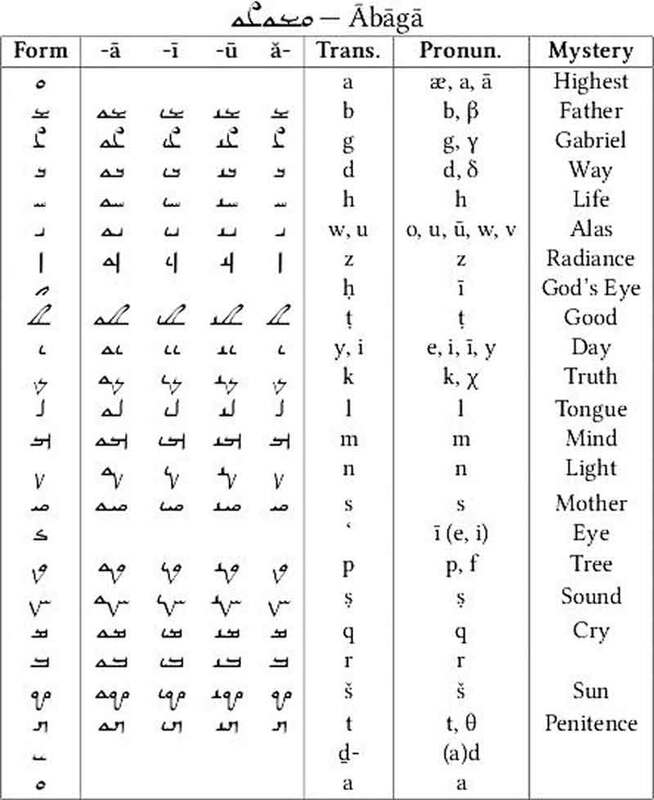 - See for example the Phoenician, Sogdian and Mandaean alphabets. - The model for the runes is believed to be a northern Etruscan alphabet, more specifically one from the circle of numerous different alphabets of Northern Italy and the area around the Alps (4th through 1st centuries BC). 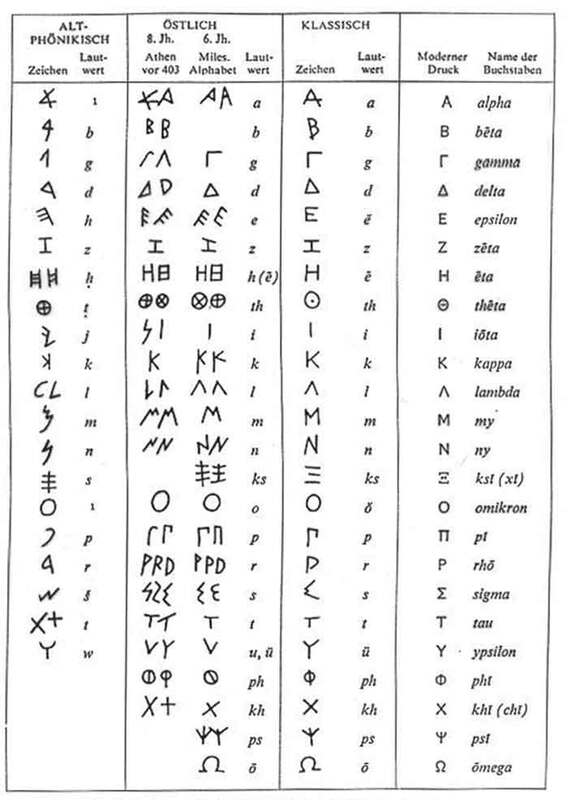 Like the Latin alphabet, all these alphabets are descendants of the Western Greek alphabet (Greek cultural influence by merchants and colonies in Italy began in the 7th century BC). From a cultural-historical point of view, this theory is hard to confirm, as it implies that the runic script must have formed in the Northern Italian, Western Alpine or Noric areas (1) in either the 1st century BC or the 1st century AD (where there is not a single trace of it) and then spread right to the north of Germania, where it was most recently observed by historians, some time before 200 AD. (1) The term Noric Alps (Alpes Noricae) originates in the Roman period and refers to the mountains in the province of Noricum, in the territory of the Tyrol and Bavaria. - The Latin script is a sibling script of the Italian alphabets and thus has some identically shaped letters. Unlike the regional scripts, it became dominant across all regions with the increasing power of Rome and was spread as an administrative script throughout all corners of the Roman Empire. Germanic tribes could have encountered the Latin “Capitalis Monumentalis” of the imperial period even in the distant realms of Southe Scandinavia, which itself never belonged to the Roman Empire, through contacts with the Roman culture (via merchants, hostages, soldiers, visitors, etc. ), and could have been inspired by it to develop their own script. This theory is supported by individual character matches (which, of course, could also be simply due to the common Phoenician origin of both script systems). Many runologists advocate the Latin theory today. - Several attempts to ascribe the generation of the runes to the Goths in the Black Sea area (today: Ukraine) are no longer of relevance except as a historical footnote. According to this theory, the minuscule script, which emerged during the 2nd or 3rd century AD in eastern Greece, or an archaic Greek alphabet from the 6th century AD would serve as models. This reading is ruled out partly for linguistic reasons: the earliest series of runes clearly reflects a northern Germanic, i.e. still general Germanic rather than a differentiated Eastern Germanic sound situation. North Sea Germani: Angles, Chauci (who were later merged in the large tribe of the Saxons), Frisians, Warini. Rhine-Weser Germani: Angrivarii, Batavi, Bructeri, Chamavi, Chatti, Chattuarii, Cherusci, Sicambri, Tencteri, Ubii, Usipetes. These peoples might have become Germanized at a later stage. The large tribe of the Franconians emerged in the 3rd century from the tribes residing at the river Rhine. Unlike them, the tribes at the Weser, like the Angrivarii and the Cherusci, joined the Saxons. The Suebi (aka Suebic or Elbe Germanic groups), consisting of Hermunduri, Lombards, Marcomanni, Quadi, Semnones and perhaps (debated) the Bastarnae: during the 3rd century they provided the basis mainly for the large tribe of the Alamanni. In addition, by mingling with other tribes and enthnic groups, the Marcomanni created the large tribe of the Bavarians, while the Hermunduri founded that of the Thuringians. Part of the Suebi crossed the Rhine around 406 AD and immigrated to Hispania with them in 409 AD, where they formed the Suebi empire in the northwest, which later served as a basis for the state of Portugal. The Lombards, from whom Lombardy has its name, also included other Germanic groups in their tribe and founded empires first in Pannonia and later, after their conquest in 568 AD, in Italy. Northern Germani, or Baltic-Sea Germani on the Jutland peninsula and in southern Scandinavia: Aesti, Suones (Swedes). Based on linguistic evidence, the Scandinavian tribes are classified as northern Germanic. The Angles and the Jutes represent a transition area between them and the North Sea Germani. Later, they became the Danes, the Swedes and the southern Norwegians. In how far the remaining Norwegians and Icelanders are also part of them, depends on the concept of the term “Germanic”. Archaeologically, the northern Germani are divided into the eastern and western Norse groups. Oder-Warthe Germani: Burgundians, Lugii, Vandals. Archaeologically, they are attributed to the Przeworsk culture (in southern Poland). Vistula Germans: Bastarnae, Gepids, Goths, Rugii, Scirii. Archaeologically, they are attributed to the Wielbark culture, whose predecessor was the Oksywie culture. After the Wielbark culture had expanded into the area south of the Baltic Sea, it shifted towards the southeast, where it became the Chernyakhov culture of the 2nd through 5th centuries AD. Those Germanic tribes who moved enormous distances at the time of the mass migration are mostly Eastern Germani, such as the Burgundians, the Gepidae, the Goths, the Lombards and the Vandals. Their empires never lasted long, though; all eastern Germanic languages are extinct today. The tribes living west of the river Elbe, such as the Franconians, the Saxons and the Angles, were relatively sedentary. The same is true for the northern Germani, who did not develop extensive migratory activities before altered conditions prevailed during the Viking period. 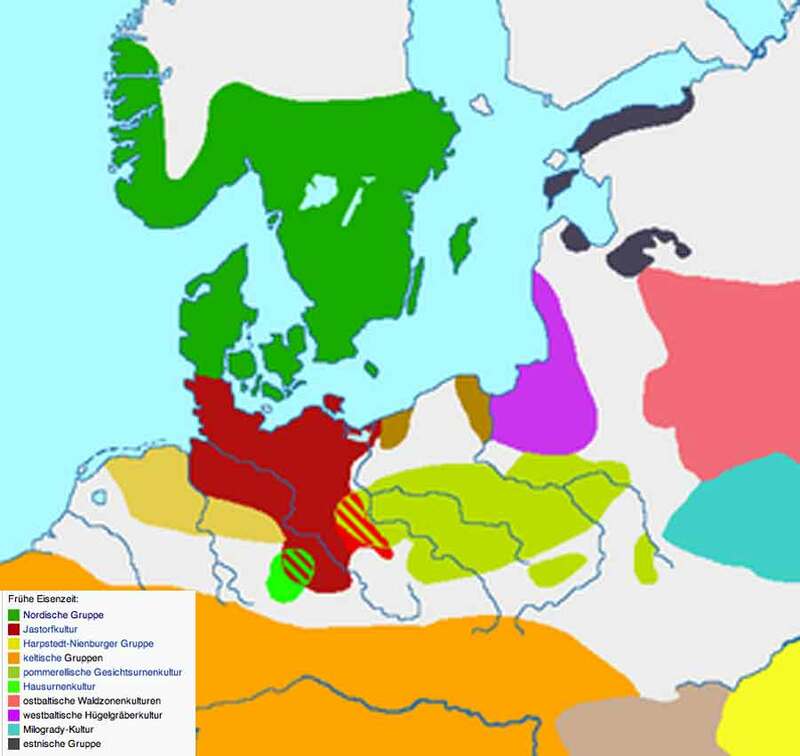 Their languages (Western Germanic and Northern Germanic languages) have survived and developed until today. At the time of the mass migrations, Germanic tribes founded empires in North Africa, in contemporary France, in Italy and on the Iberian peninsula, and they also migrated to Britain. A majority of the Germani were unfamiliar with an administrative system as it was known in Rome and is common today. 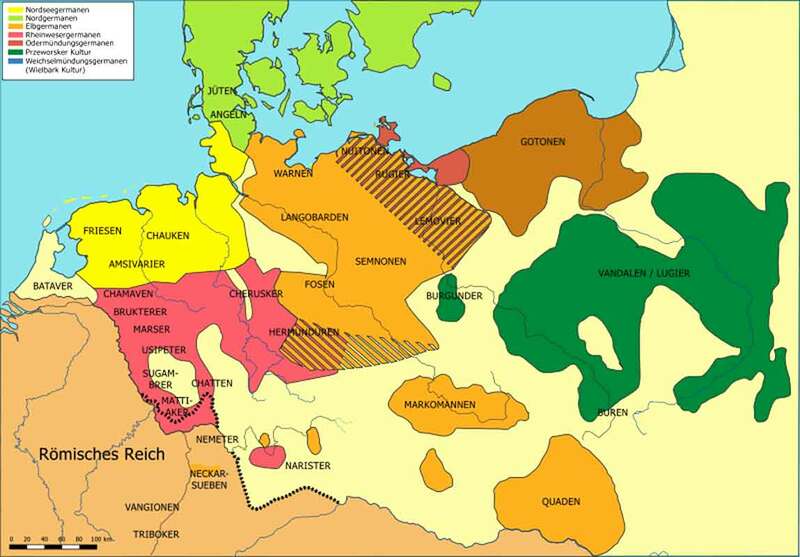 The empires of the Germanic tribes were organized in a manner comparable to feudal land tenure.